Businesses use custom Facebook Pages to run promotions and sweepstakes, collect data, generate leads, and brand their Facebook Page. 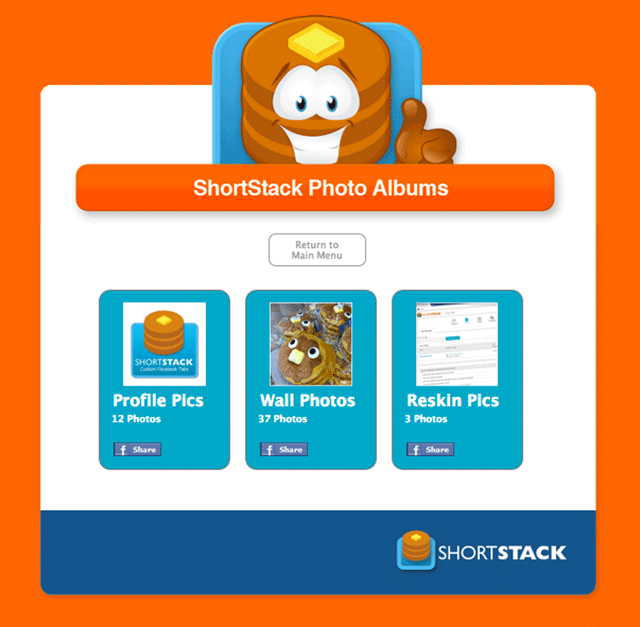 The business marketing opportunities with apps are endless, especially when you use a platform such as ShortStack, which allows you to embed your apps outside of Facebook on your blog or website, and provides a Smart URL so your apps are mobile friendly. We’ve broken down these 100+ template into five categories, Promotions, Integrations, Informational, Holiday, Sports and Basic Templates. Within each category the templates are in alphabetical order. You can click the links below to jump to a certain category or simply scroll down to view everything! 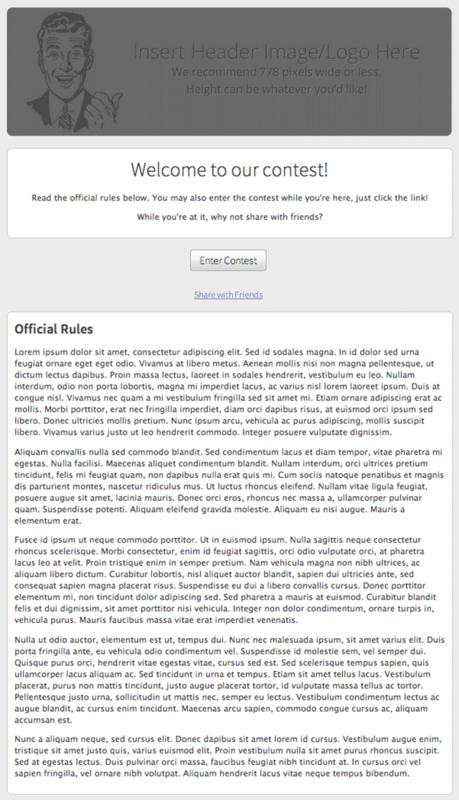 DESCRIPTION: Use this template in conjunction with a Timeline promotion to display your official contest rules. 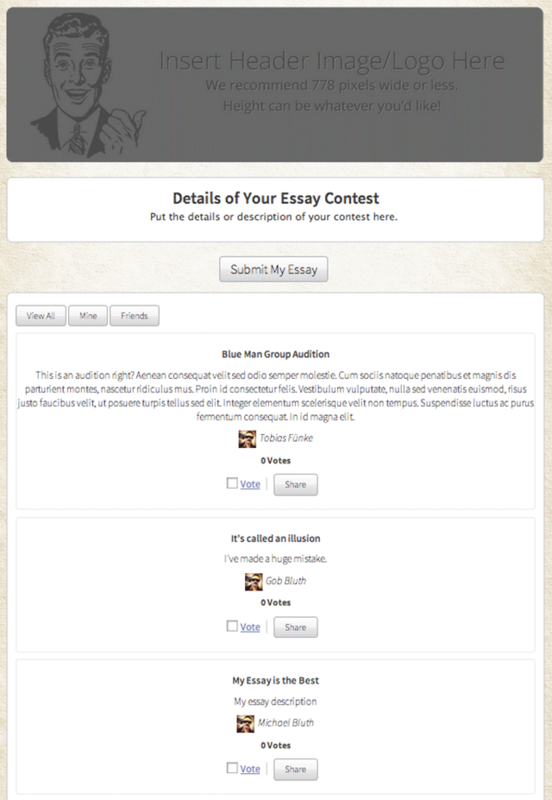 DESCRIPTION: Get your fans to tell their stories with this Essay Contest template. Not only is this a great way to become more in-touch with your fanbase, with the Voting Widget integrated, it’s a great way to increase fan interaction with your Page. 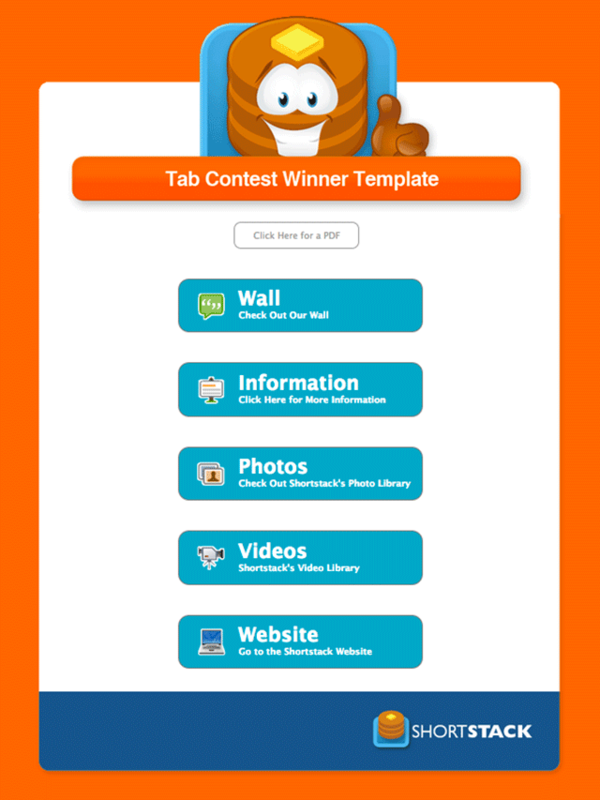 DESCRIPTION: Use this template to run a text-driven promotion, like an essay or writing contest. 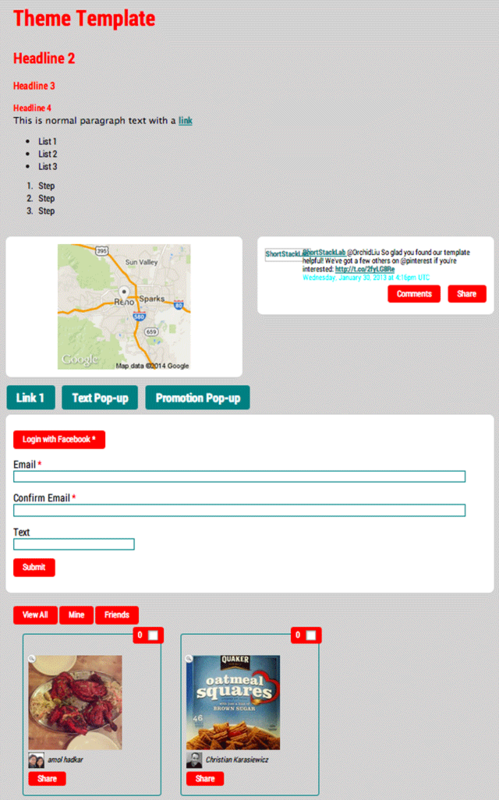 DESCRIPTION: Similar to the General/Sweepstakes template, the Fan Reveal Promotion template has a built-in Fan-gate. 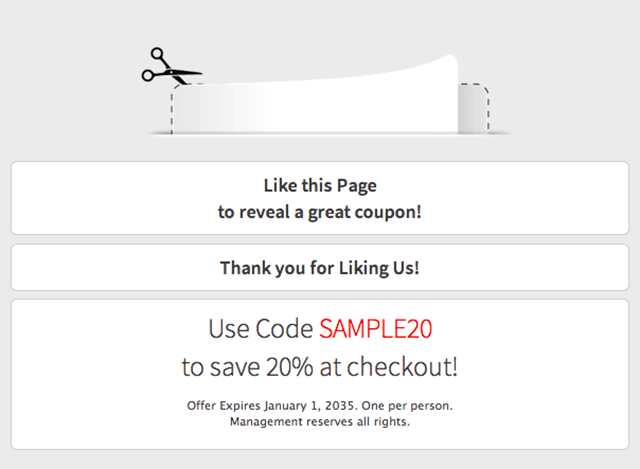 Non-Fans (users who haven’t “Liked” your Page) will see an image encouraging them to Like the Page to see more. Once they do, they’re able to enter the promotion. 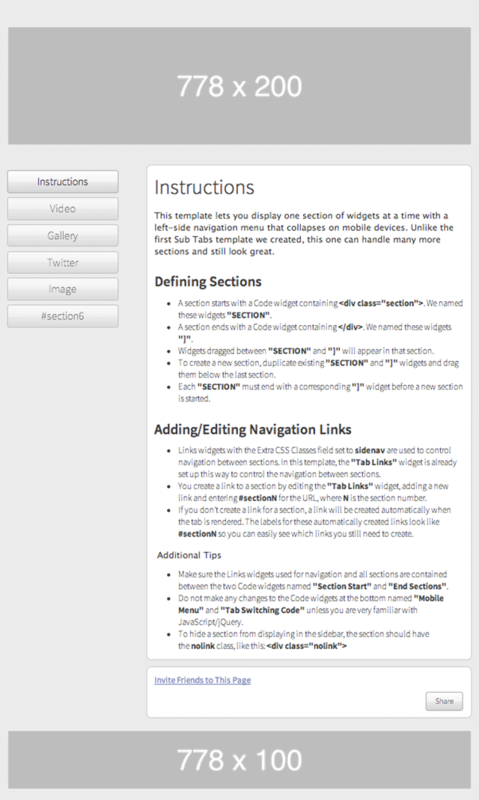 This template also includes About, Contact, and Website links. 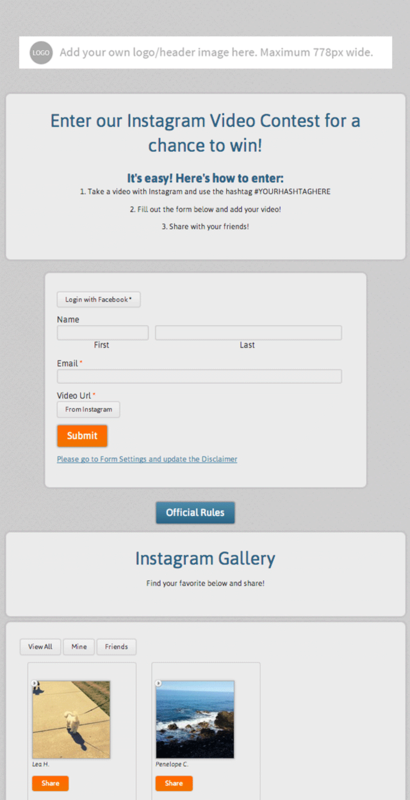 DESCRIPTION: Host an Instagram Video contest right within your Facebook Page using this template. Ask fans to upload videos to Instagram using a specific hashtag then display the videos through your Facebook Page. 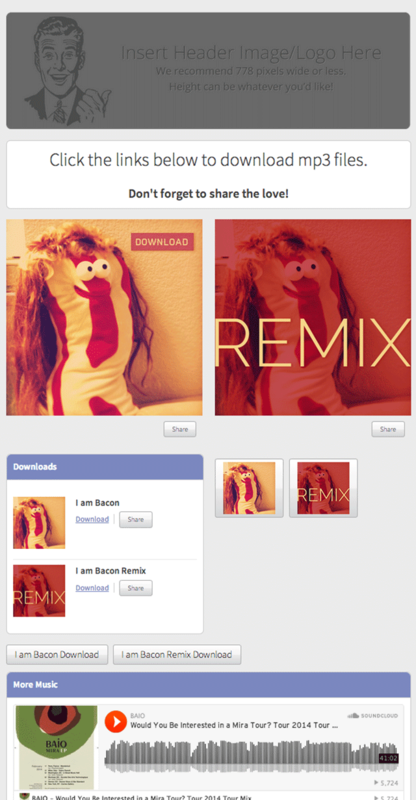 DESCRIPTION: Use this template to encourage Fans to Like your Page in order to download music. Great for musicians, coffee shops, artists and record labels. 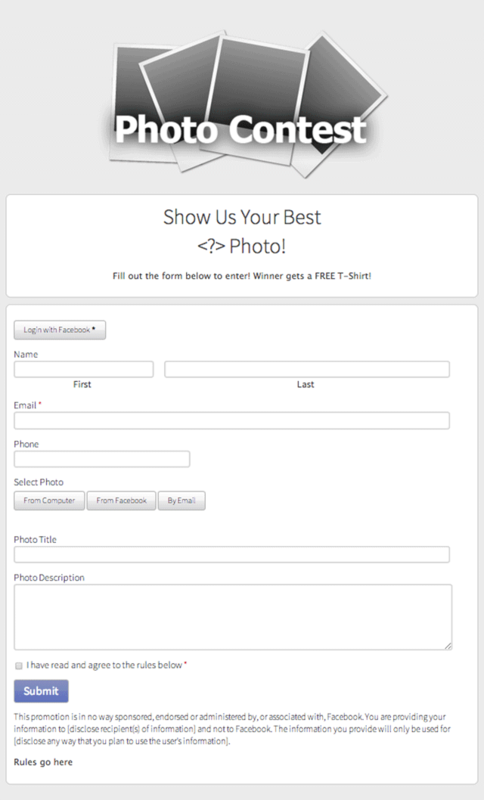 DESCRIPTION: Whether it’s pics of your Fans wearing your latest fashions, or snapping shots of their favorite nature scenes, a photo contest is a great way to boost Fan interaction with your Page. Now it’s up to you to think of a prize! 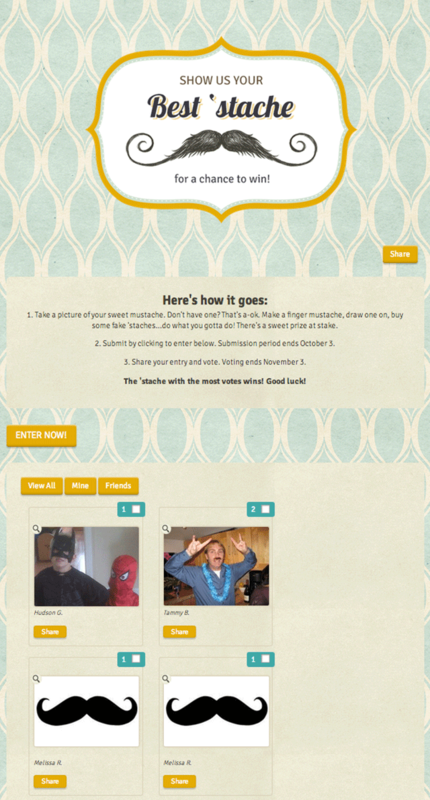 DESCRIPTION: Ask fans to submit their favorite photos to be voted on by other fans. 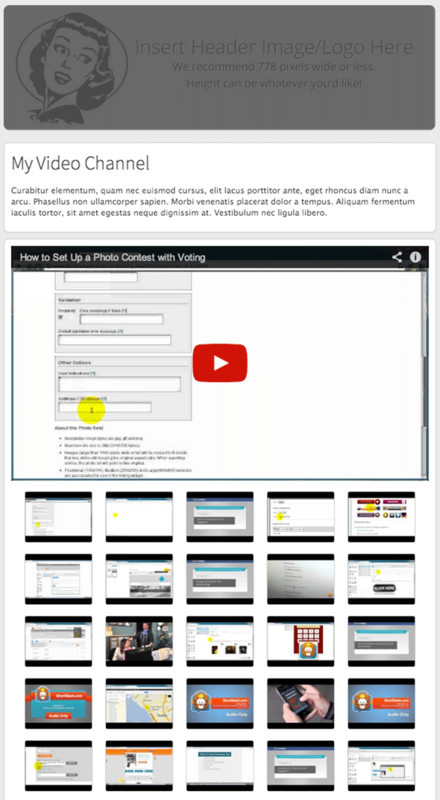 This template uses the Voting and Promotion Widgets making it easy to run an photo vote contest. 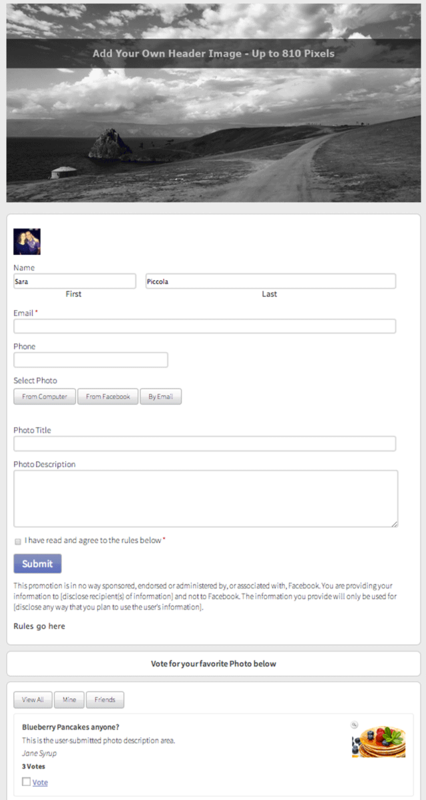 DESCRIPTION: A simple Template that incorporates a Fan Gate and uses the Photo and Voting Widgets to make it easy for you to run a Photo Vote contest right on your Facebook Page. 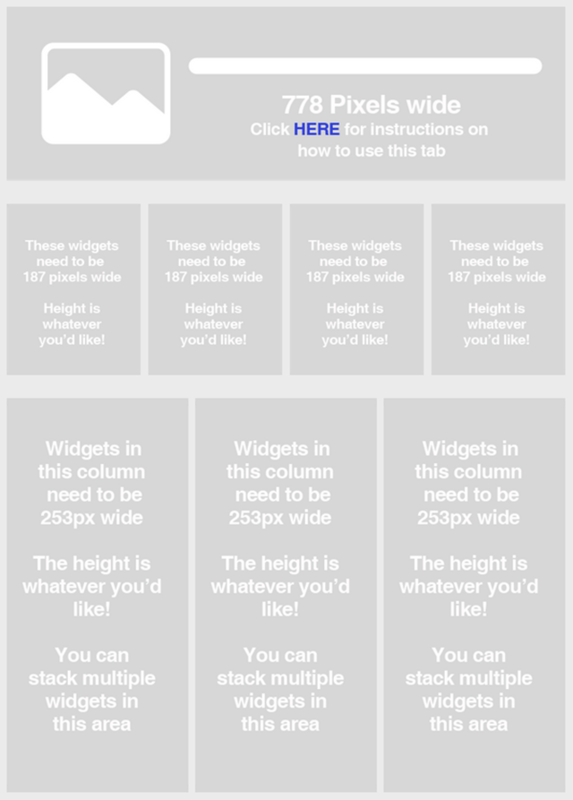 This Template features no CSS so it’s easy to edit and customize to fit your brand. DESCRIPTION: Create a Pinterest board with a special hashtag then ask Fans to Pin pictures using that Hashtag. 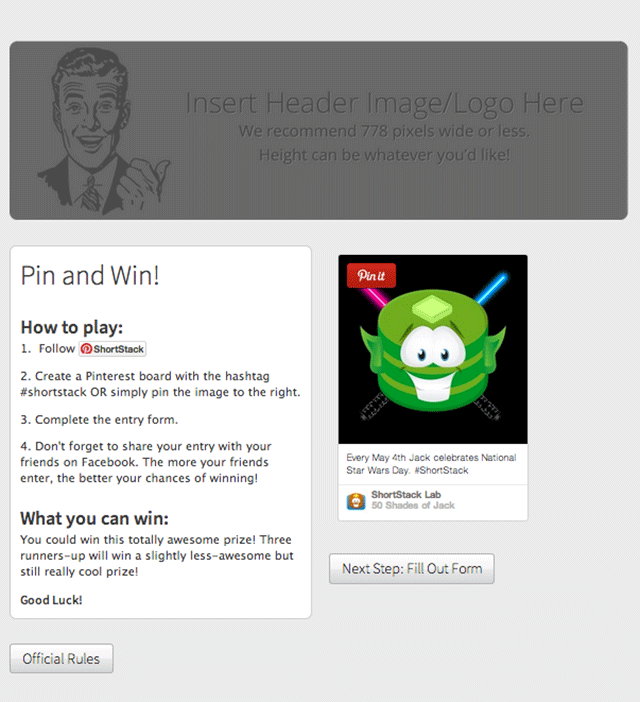 The pins will display through this Template and you can easily pick a winner. 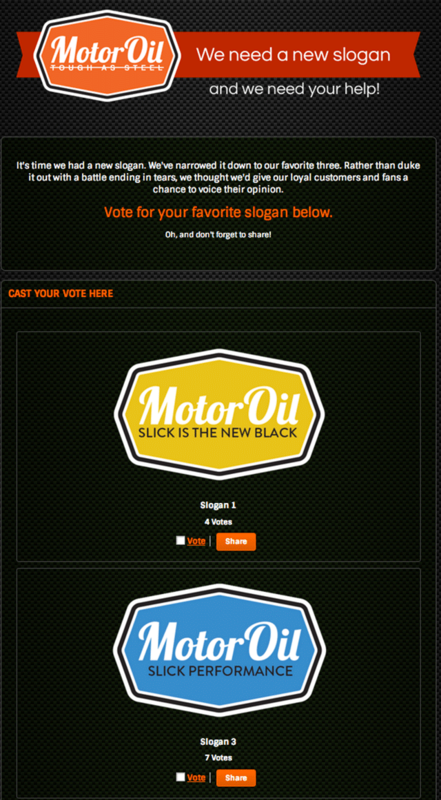 DESCRIPTION: Use this template to ask your fans to cast a vote before entering your contest. 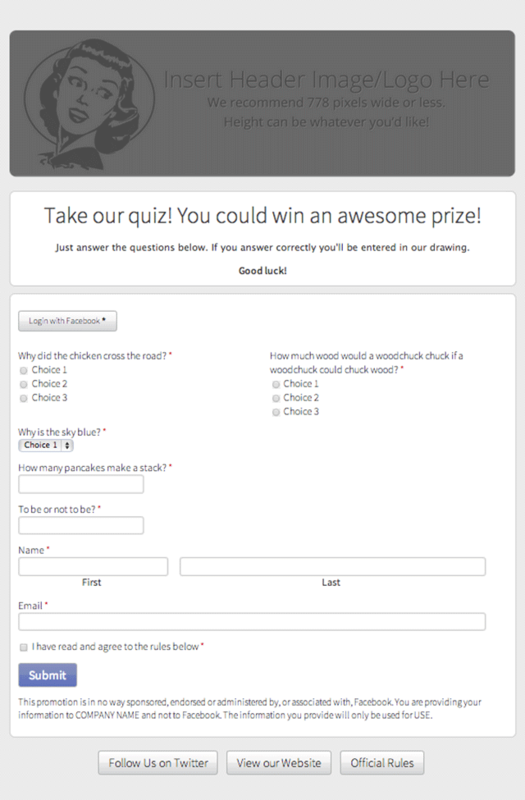 DESCRIPTION: Create a fan-gated app that lets you pose questions to your fan in a Quiz format. DESCRIPTION: Want to get more entries on your promotions? 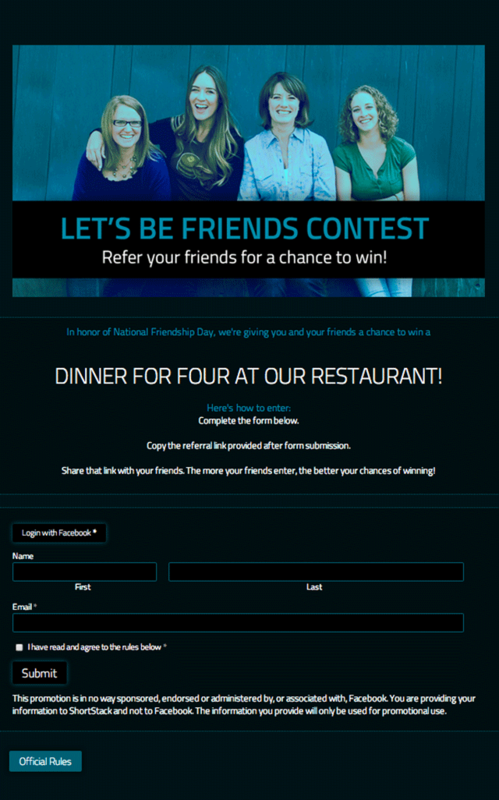 Encourage Fans to share your contest with their friends and receive extra entries for doing so. 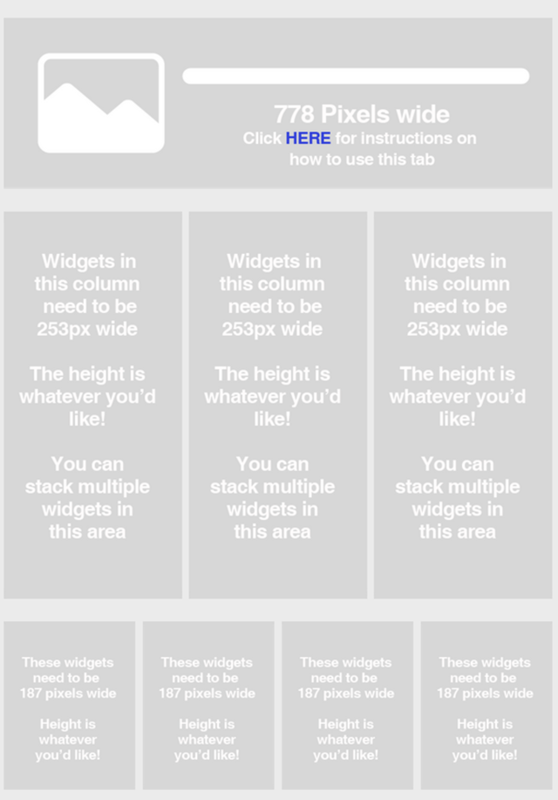 This template requires no CSS. DESCRIPTION: Want to really start basking in the good reviews? 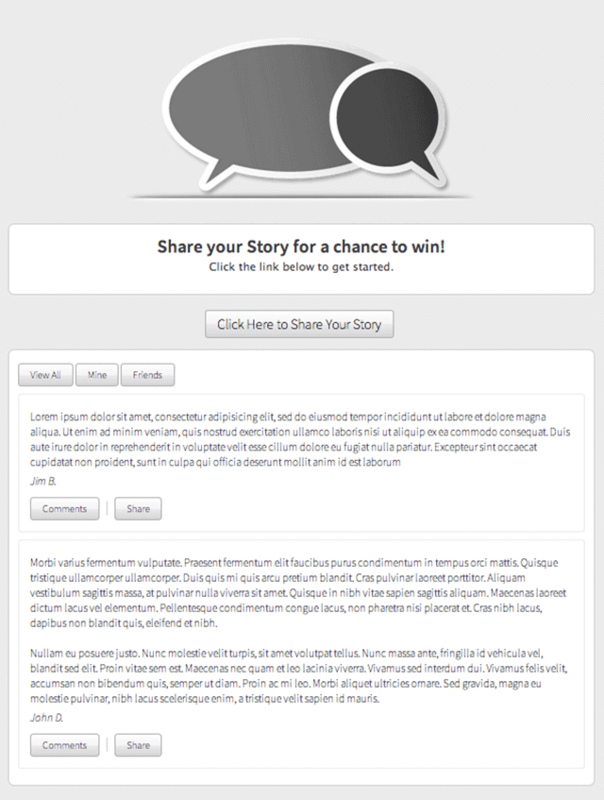 Set up a “Share Your Story Promotion” and have your Fans tell you why they love your business or brand. Then have your Fans vote on the best entry. It’s all set up when you add this template. 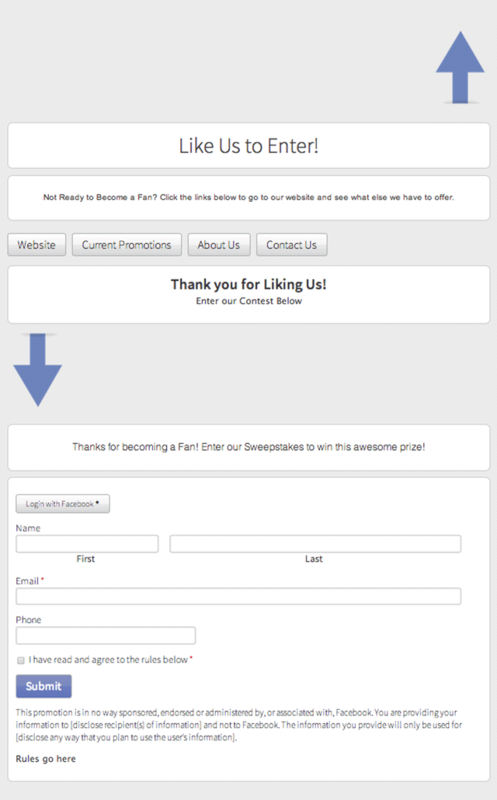 DESCRIPTION: Use this Template to offer your Fans an exclusive coupon. By collecting their name and email address you can market to them outside of Facebook. DESCRIPTION: Running a contest you want gated for Fans only? 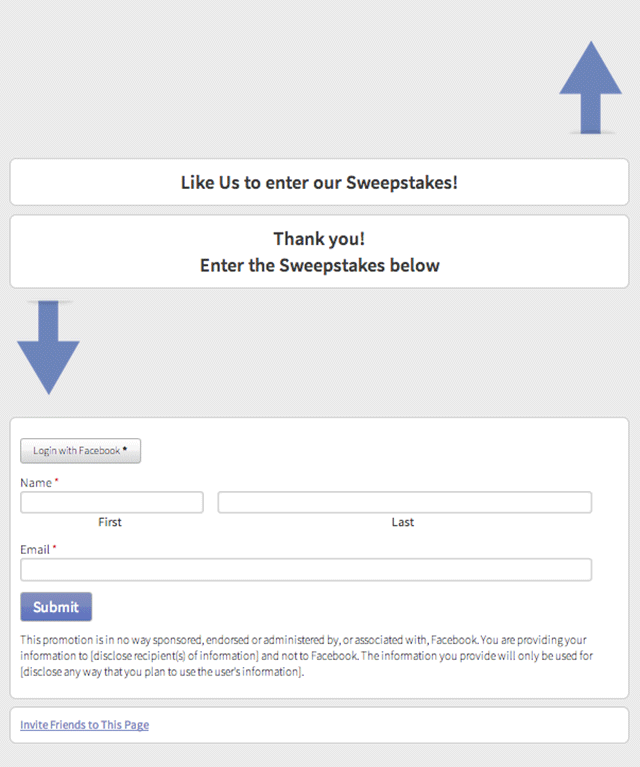 This basic fan-reveal, contest entry template encourages non-fans to Like your Page, and then gives them the opportunity to enter your contest. 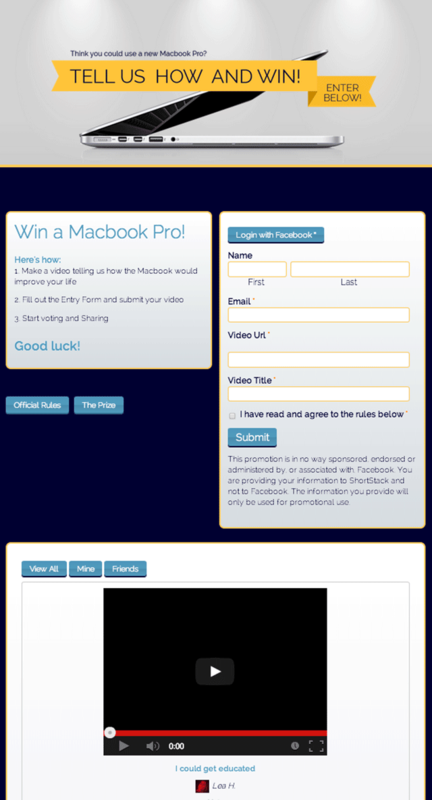 DESCRIPTION: This Template is set up to allow fans to take a video of themselves outlining why they deserve to win your prize. 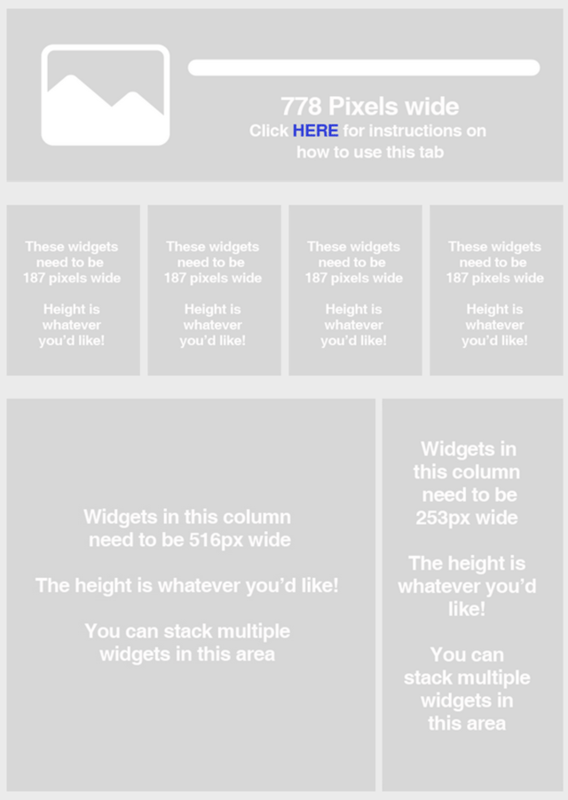 This template requires no CSS. 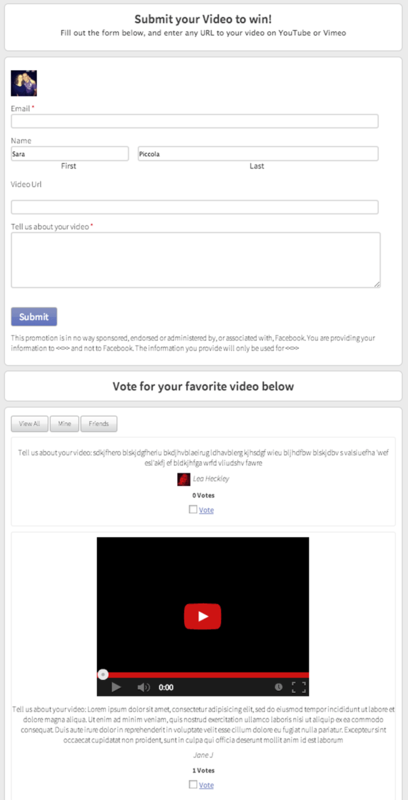 DESCRIPTION: With video uploads and voting, your fans will love the interaction this fun template brings. 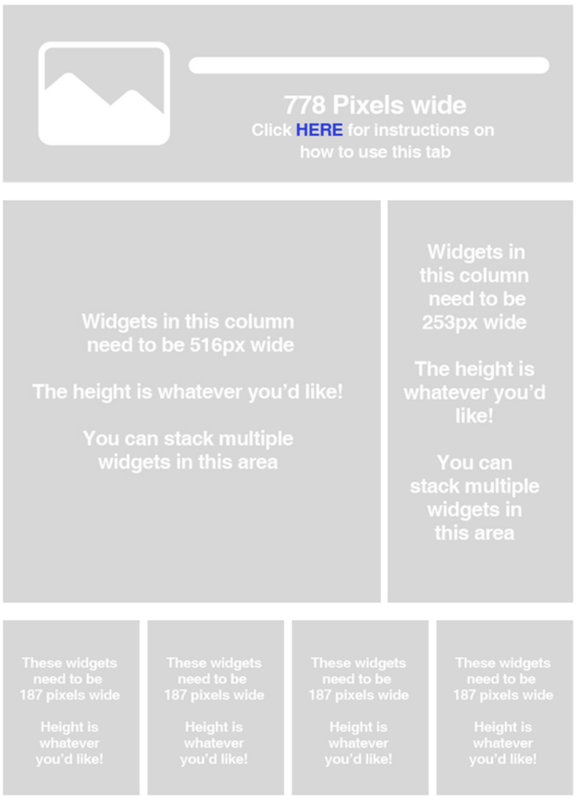 With a custom form already set up, you’ll love the user data this template delivers. 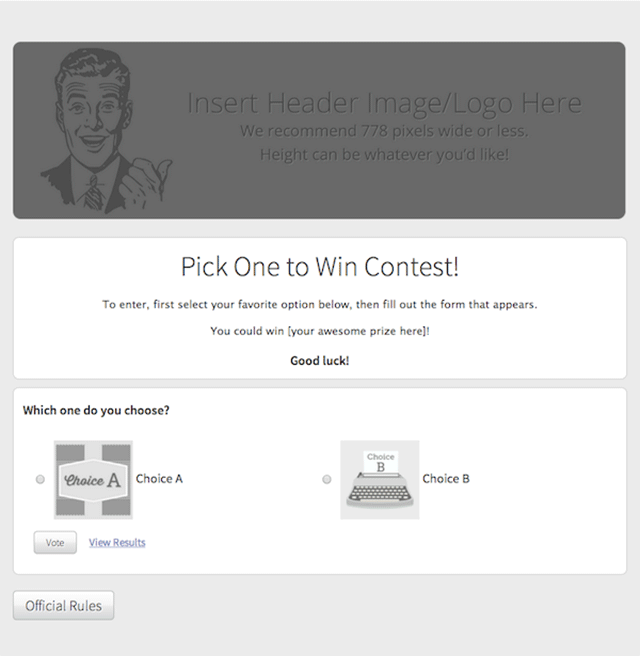 DESCRIPTION: Use this Template to provide your Fans with admin generated images to vote on. You upload the content yourself then get the opinions from your Fans. 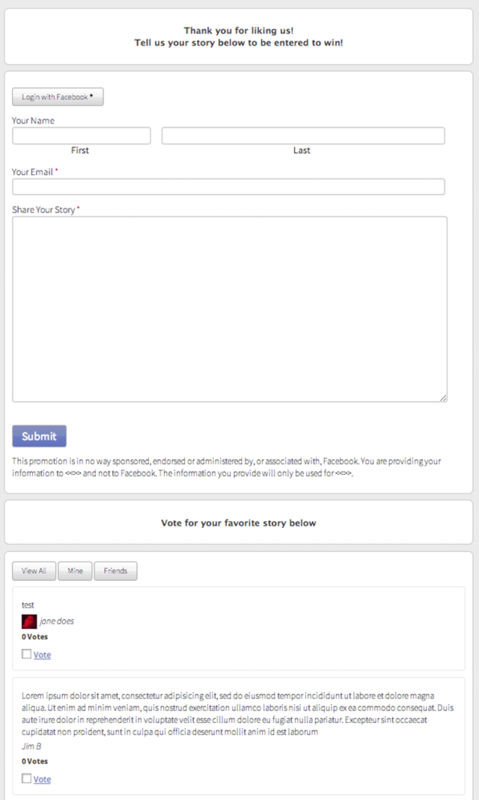 DESCRIPTION: Use this Template when you want Fans to vote for their favorite (fill-in-the-blank) in order to enter a sweepstakes promotion. 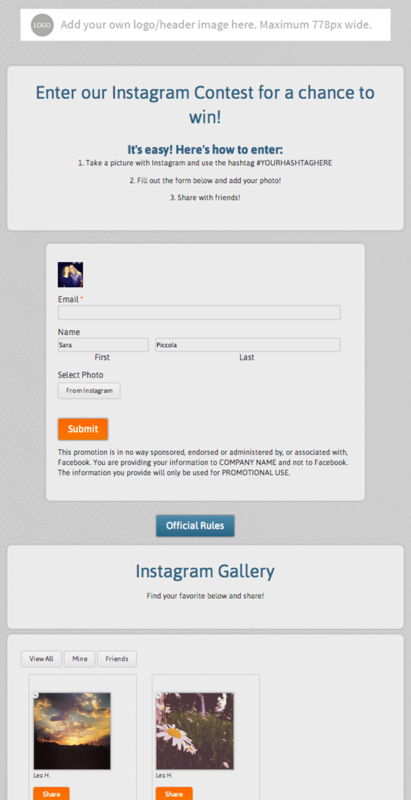 Page Admins see a form to enter the choices for Fans to choose from. 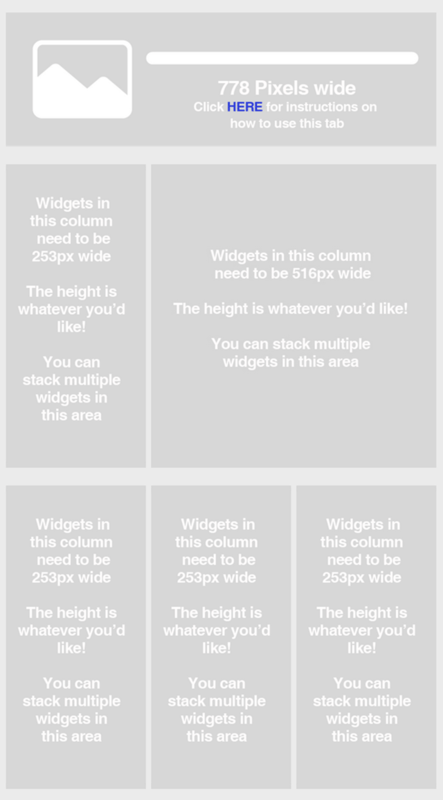 DESCRIPTION: Whether your blog is a collection of industry forecasts or a bunch of helpful how-to’s for your customers, show it off by using the Blog/RSS template. 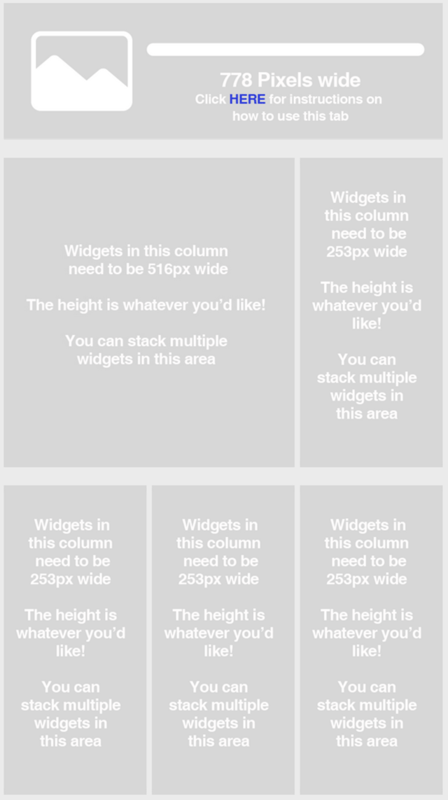 Don’t forget to personally stylize your app by selecting the theme! 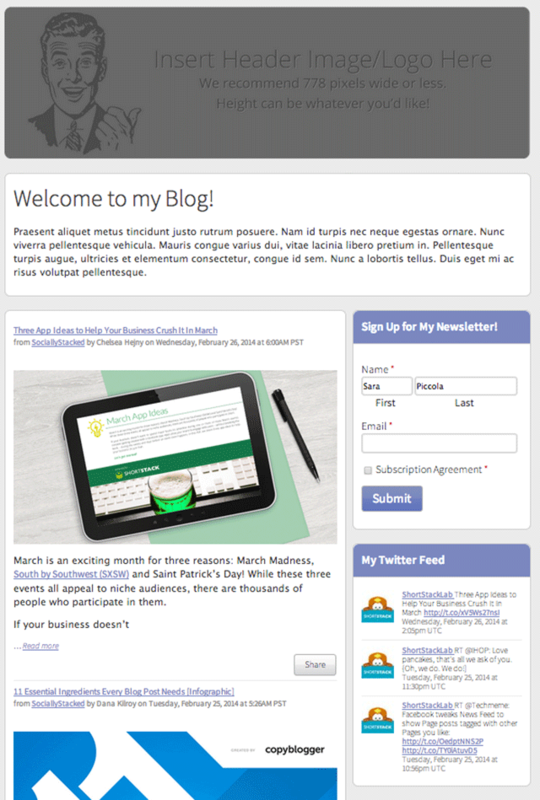 DESCRIPTION: Use this Template to provide information on yourself and your Blog. You can stream your RSS Feed, Twitter feed and accept subscriptions. 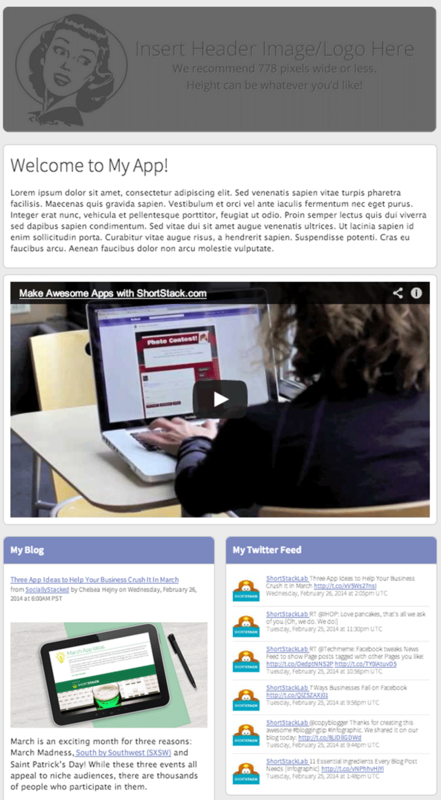 DESCRIPTION: Introduce your fans to your blog through a custom Facebook Page app with this template. 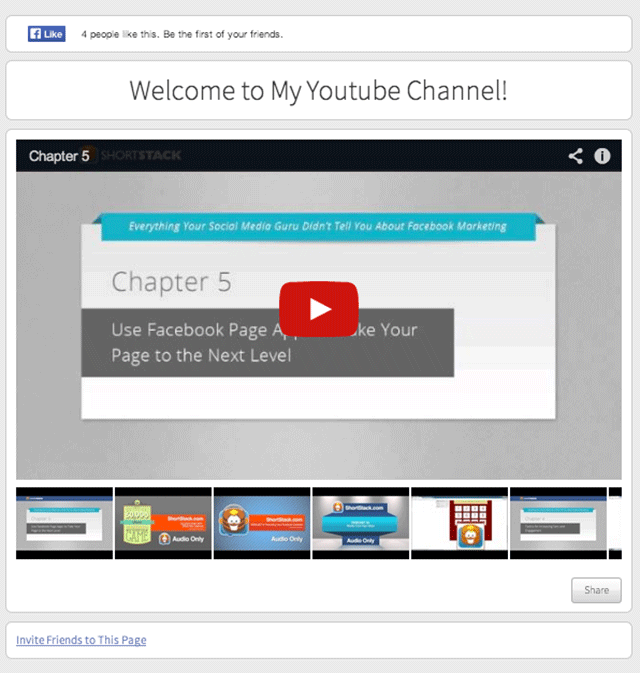 Include a subscribe button, links to your most recent posts and to other social network feeds. 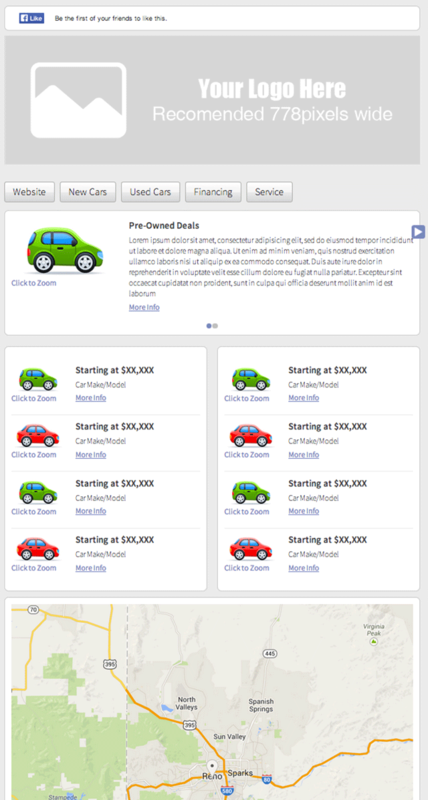 DESCRIPTION: Promote your dealerships deals with this clean, organized template. Showcase new cars, used cars, and promotions. 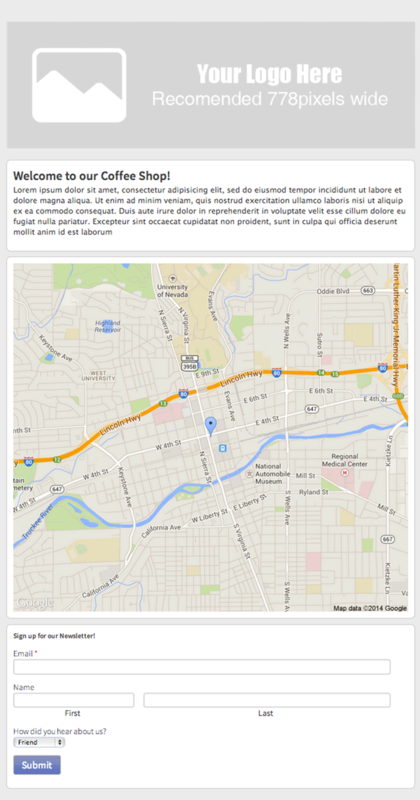 Be sure to use the map widget to show potential customers where you’re at! DESCRIPTION: This virtual business card has everything your fans need to learn more about your business – company logo, contact us, Google maps – it’s all integrated. Remember to check out custom themes to find your unique colors! 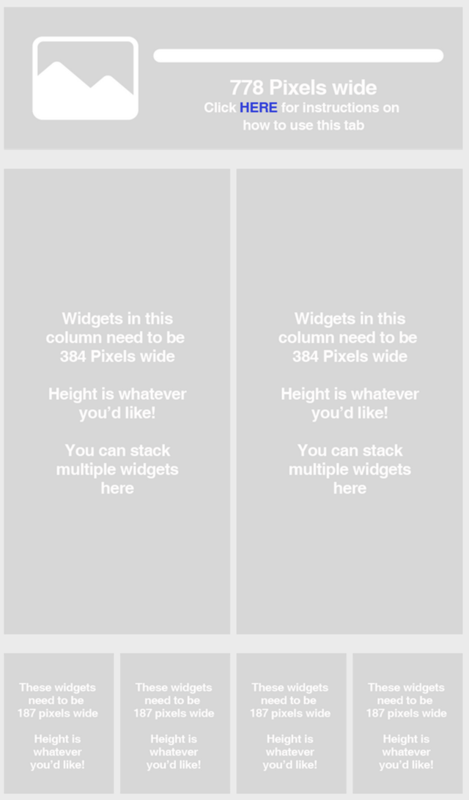 DESCRIPTION: Integrate with your favorite picture friendly app Instagram! 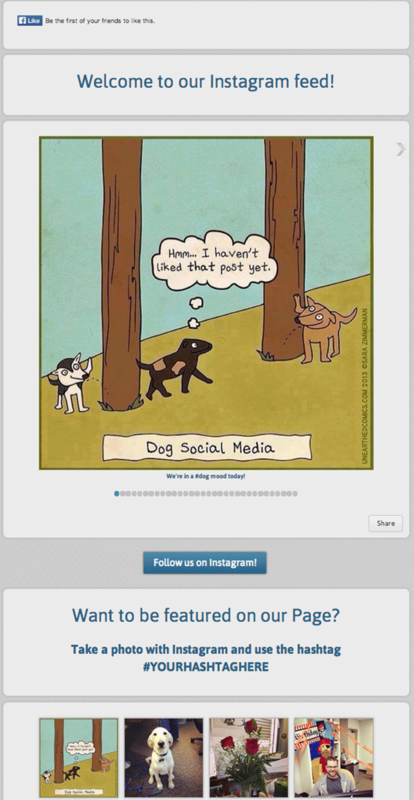 Ask fans to upload a photo to Instagram using a specific hashtag and upload it to your Facebook Page app. 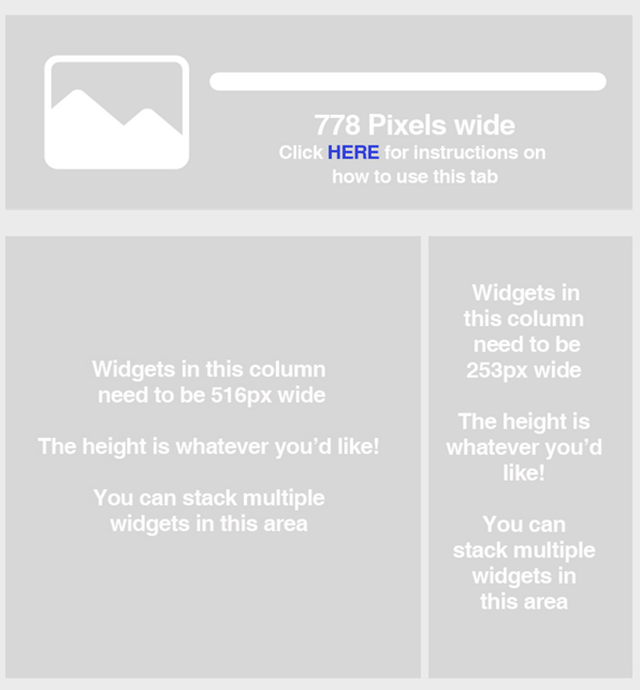 DESCRIPTION: Feature your Instagram feed on your Facebook Page through a custom app using this Template. 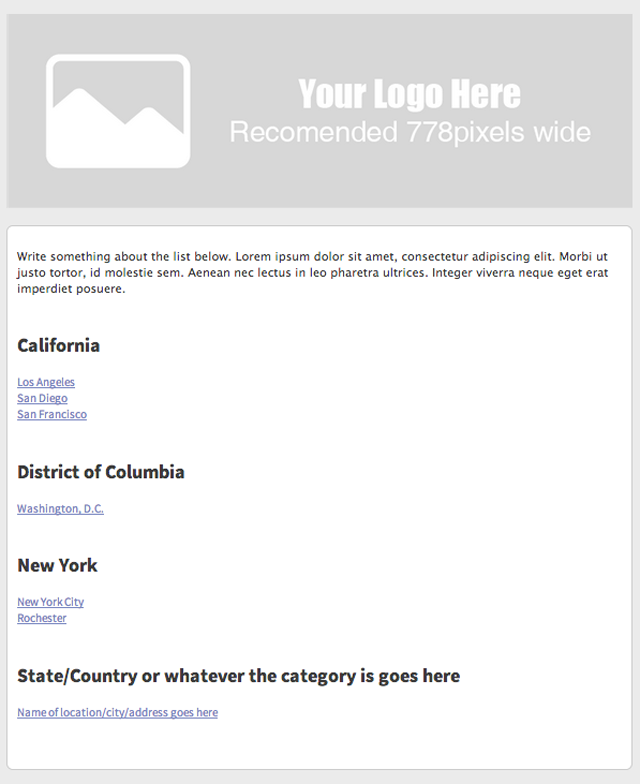 DESCRIPTION: Similar to our Corporate Business Card template, the LinkedIn template includes the Widgets to add your company logo, contact information, and a map of your location. 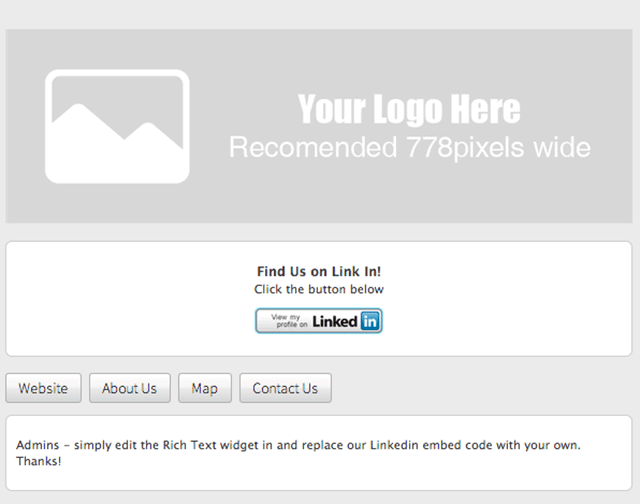 Plus, new integration adds the ability to display your LinkedIn profile. 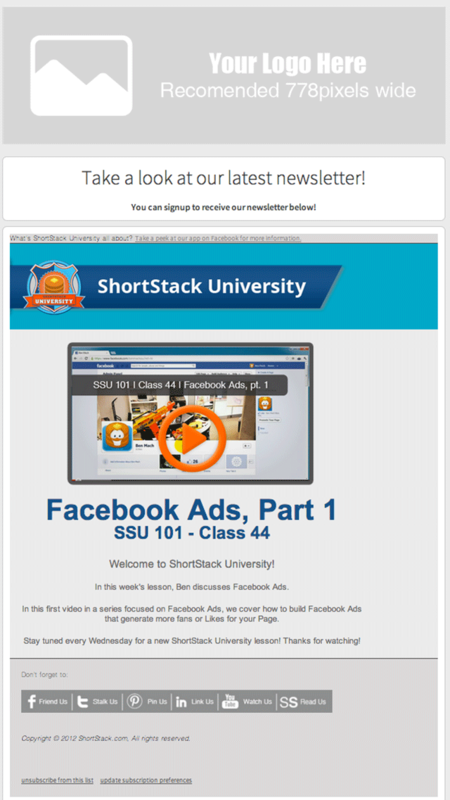 DESCRIPTION: Looking to collect email address through your Facebook Page? 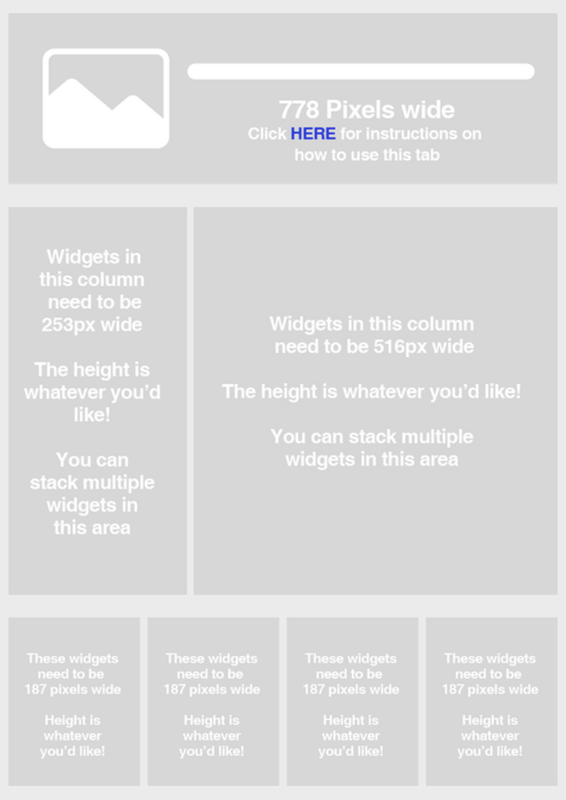 Use this MailChimp Template that will connect directly to your MailChimp lists so you can easily build and send emails. 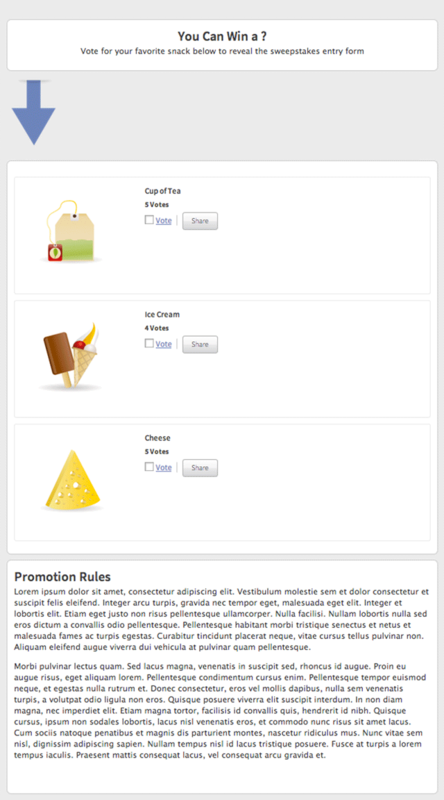 DESCRIPTION: Display your recent Pins on your Facebook Page with this template. 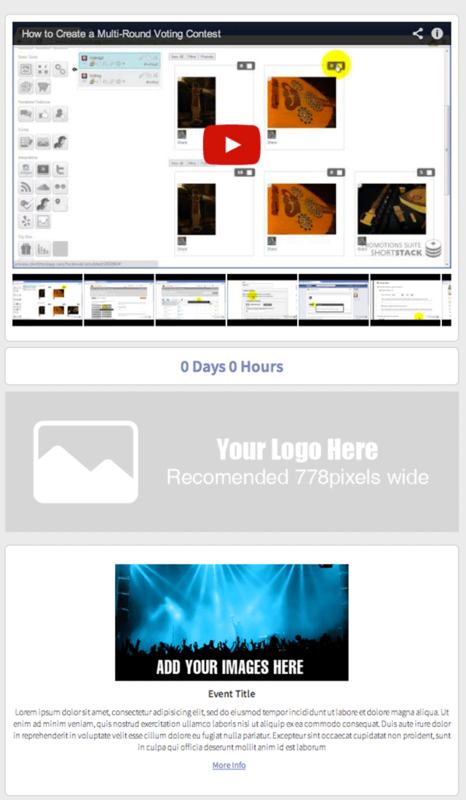 DESCRIPTION: This template is a virtual photo album- link fans to already-existing collections on Facebook, or send them to other galleries you’ve set-up around the web! 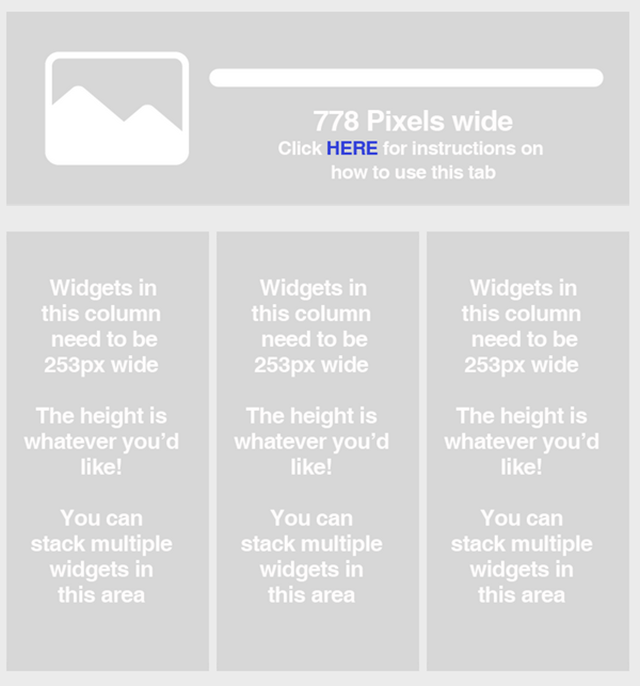 DESCRIPTION: With this template, everything is all in one place! 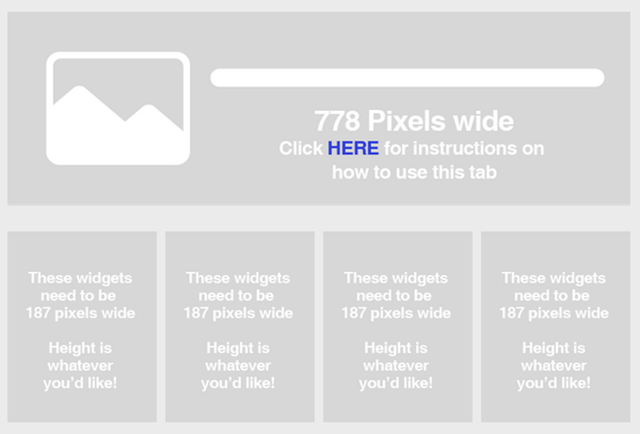 This clean design features animated links with mouse-over effects that direct visitors to the Wall, Info, Photos, Videos, and Website. DESCRIPTION: This videos app features three animated links: hover your mouse pointer over a box to see the mouse-over effects. Click on the play button, and the box expands to display the video. 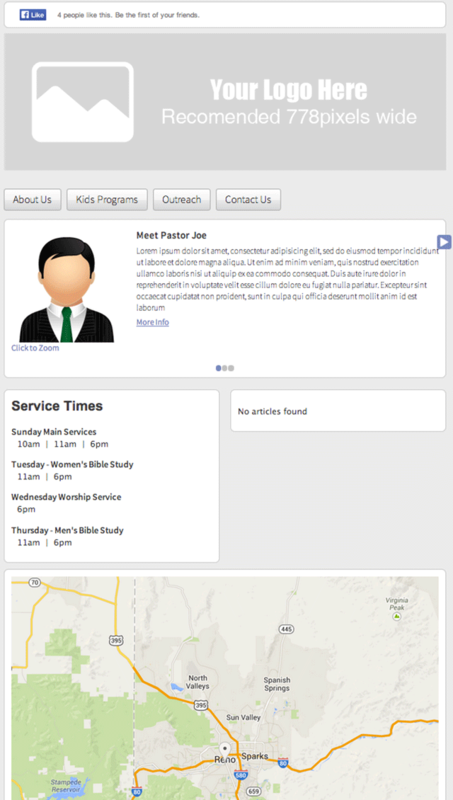 DESCRIPTION: Use our Church template to give your members all the information they need. From upcoming events/services, to youth group information. DESCRIPTION: Direct fans to your favorite spots in town with this Restaurant Reservations Template. 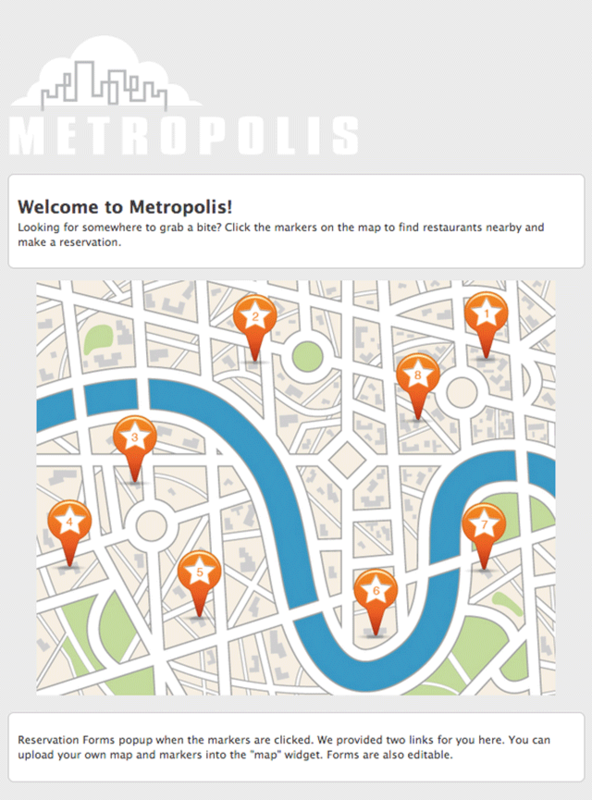 If you have multiple restaurant locations this template is perfect for finding the perfect location for your fans. The restaurant reservation form pops up when a location is clicked! DESCRIPTION: Make your coffee shop stand out from the others with this customized app. 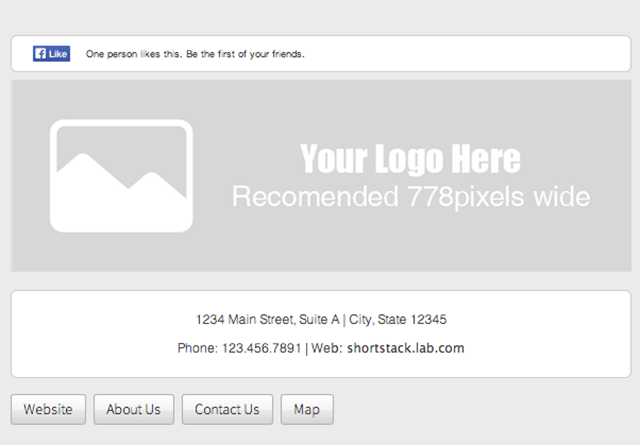 Show your location, logo, menu, or let users sign up for a newsletter. 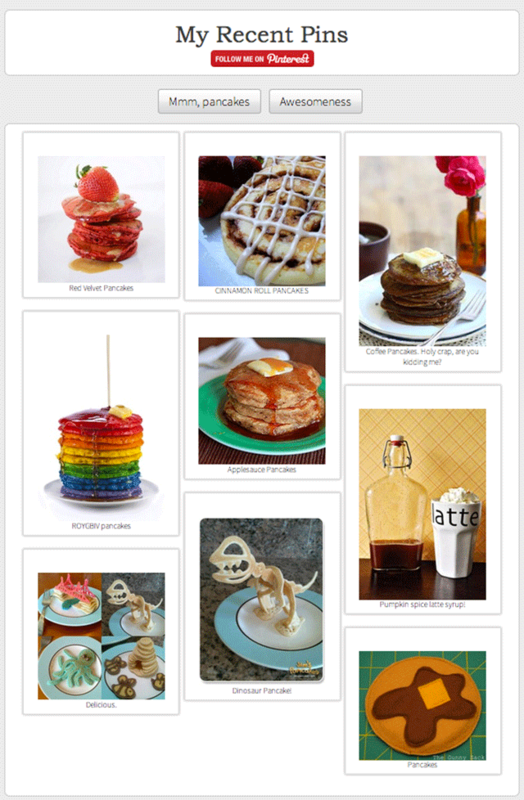 Hint: check out the Bakery and Cafe themes! 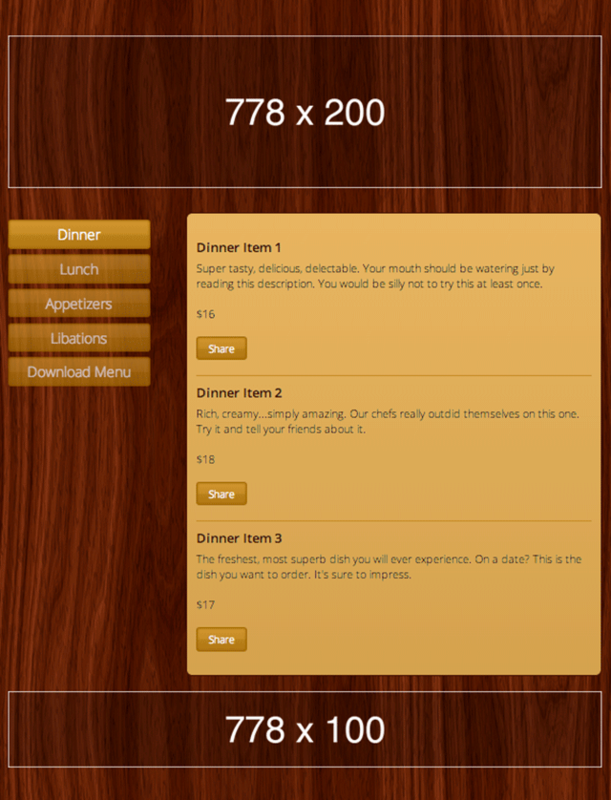 DESCRIPTION: An all in one template for restaurants. 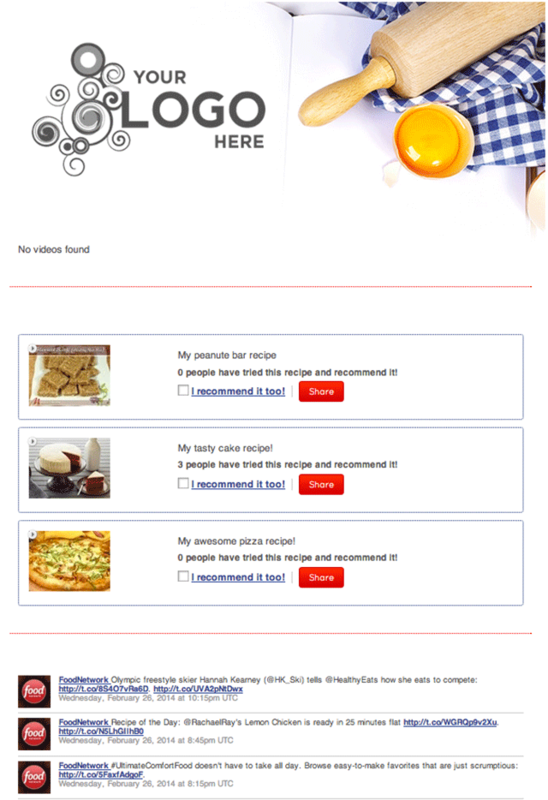 Restaurants can display their favorite recipes, integrate with Twitter, show their location and link to their newsletter with this template. 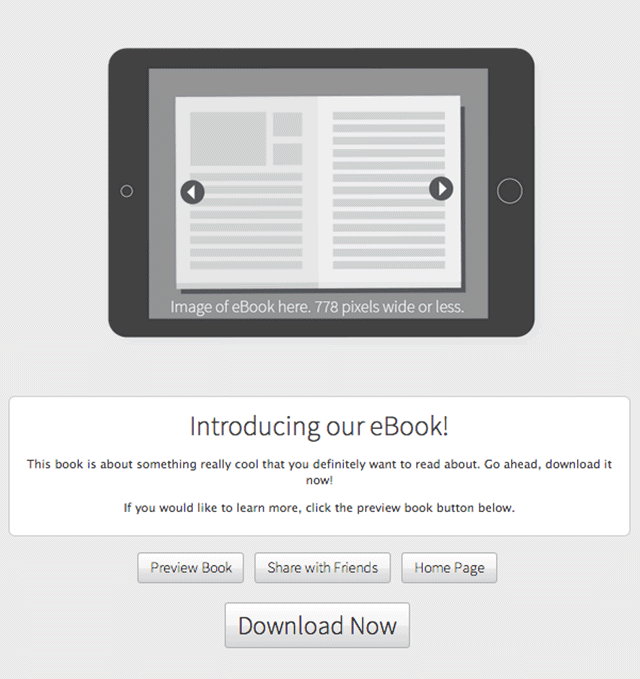 DESCRIPTION: Use this template to let users download your eBook. Facebook Fans love resources that educate them on being more successful in their industry and on social media. DESCRIPTION: Whether you’re setting up a meeting, concert, or party, the Event Planning template organizes all the info for you – and the attendees – in one place. And with the Countdown Widget, excitement will build until the big day! DESCRIPTION: Just a simple locations template, let people know where you’re at, and even give them directions. 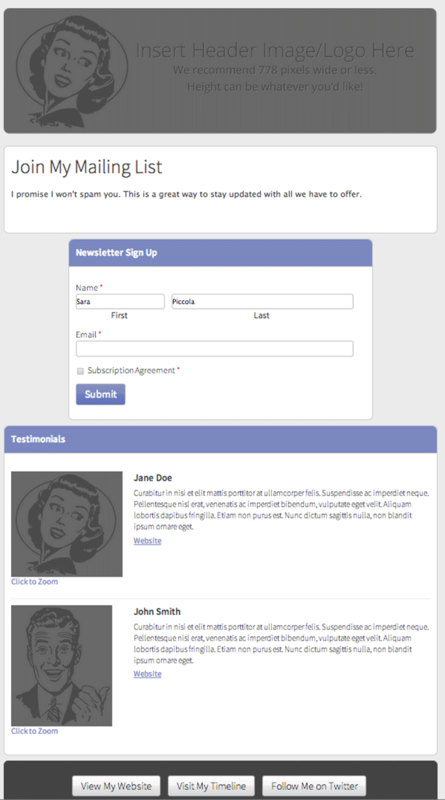 DESCRIPTION: Ask Fans to join your email list with this simple newsletter signup form. 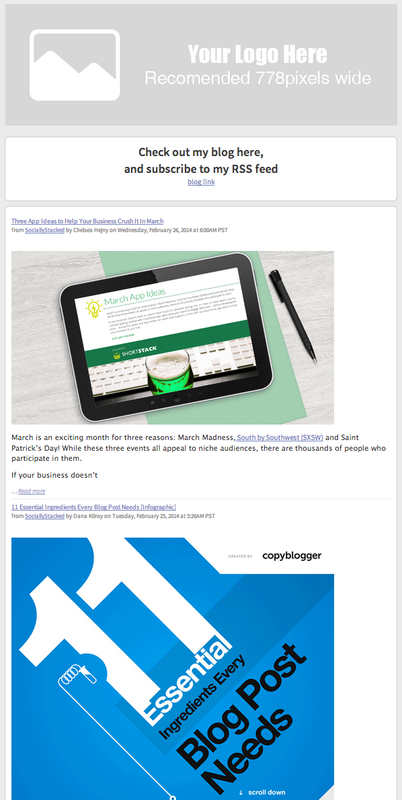 You can even list testimonials from other subscribers on how great your newsletter is! 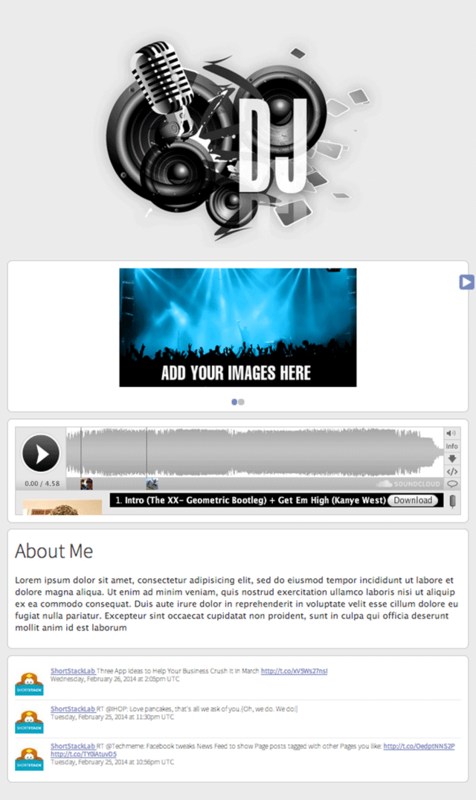 DESCRIPTION: Use this Template to feature new or existing products and resources for your Fans. 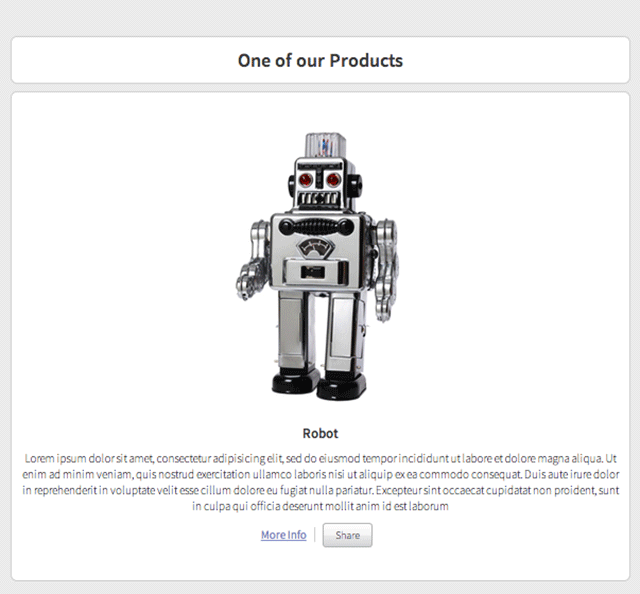 DESCRIPTION: This template has product widgets that can be scheduled to set as a featured product simply with scheduling. This is a great way to showcase new products or sales! 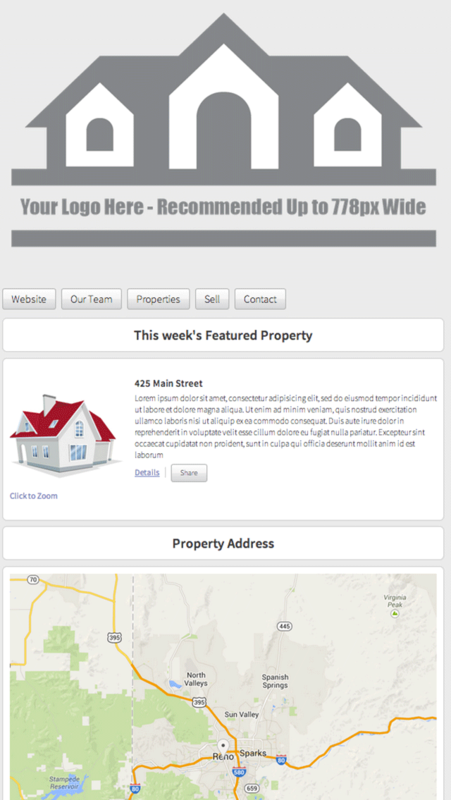 DESCRIPTION: If you’re a Real Estate Agent or business you’ll benefit from the ability to highlight one special property using this Template. Include the property address and a map. 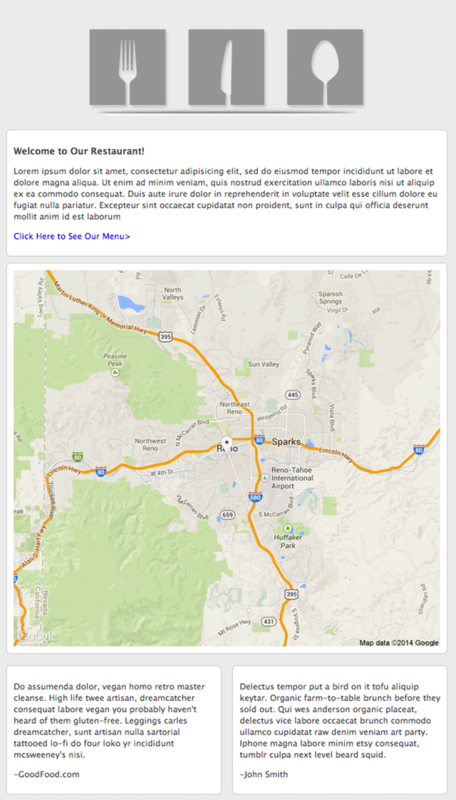 DESCRIPTION: Real Estate agents, here’s your Facebook Page solution. Pitch your services, add team bios, and incorporate your blog! 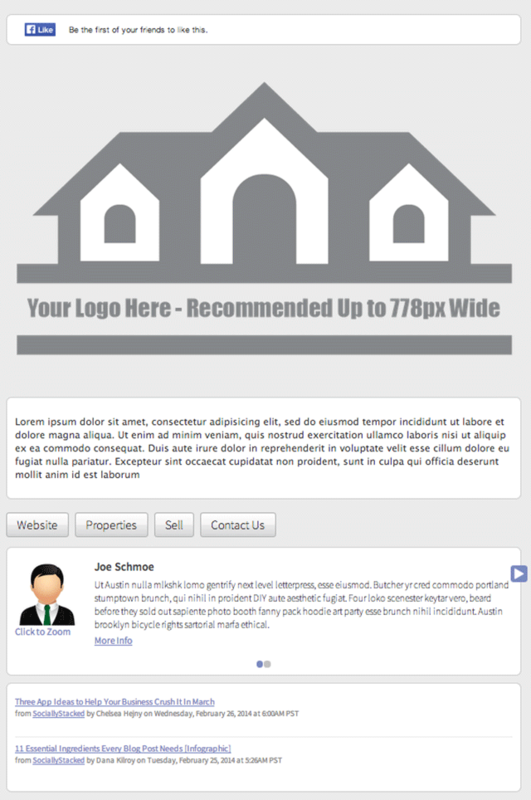 With this template, you can even link back to your website and show off your properties! DESCRIPTION: With reviews, a restaurant bio, a map, and link to the menu, it doesn’t matter if you’re running a national chain franchise or cooking up mom’s old recipes – the Restaurant Location/About template is perfect for your eatery. DESCRIPTION: Use this template to display your restaurants menu including breakfast, lunch, dinner, happy hour, libations, specials and more. 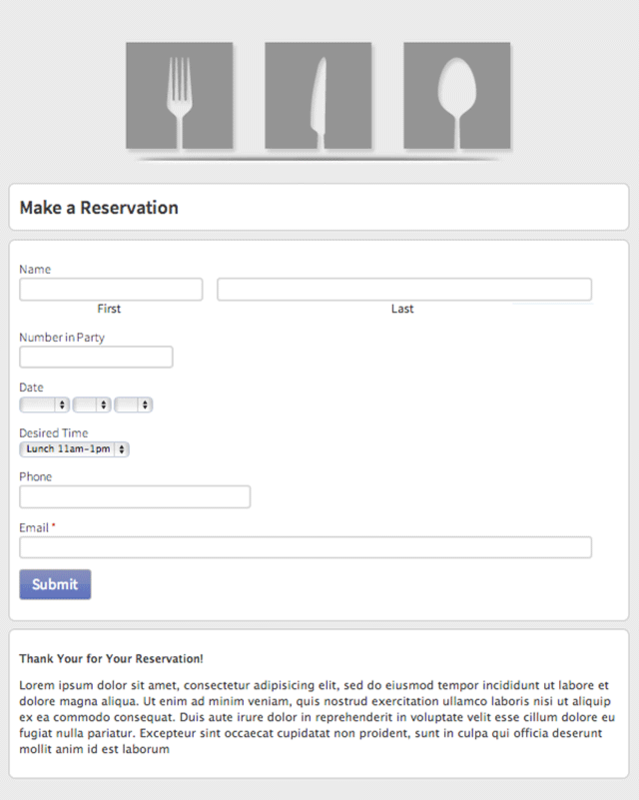 DESCRIPTION: Add this template and make it easier than ever for your patrons to make a reservation. The customized form allows them to fill out the time, date, number in party and other information. DESCRIPTION: Do you get positive feedback from your customers? 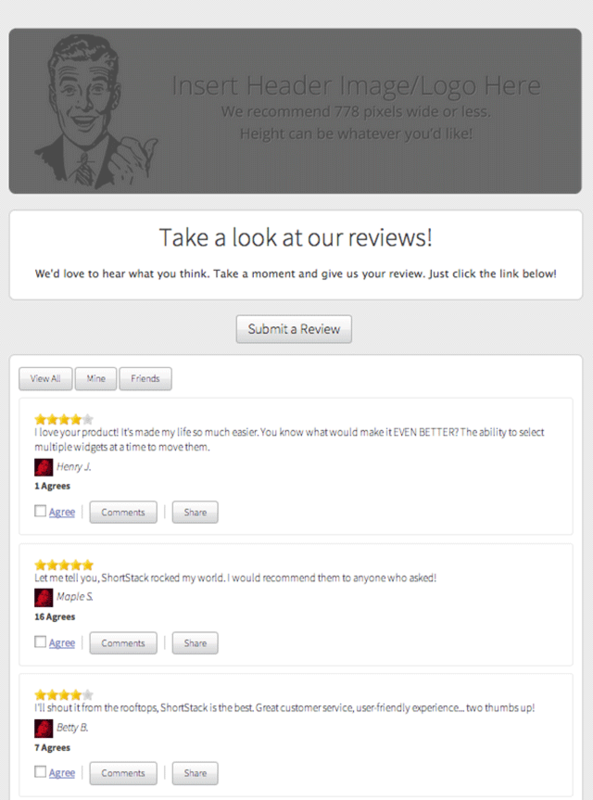 Highlight their thoughts on your Facebook Page with this reviews template. 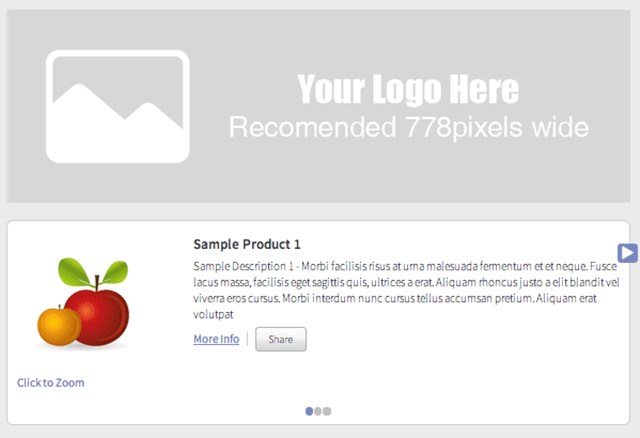 DESCRIPTION: Want to highlight your company’s best-selling product? Have to move merchandise right now? 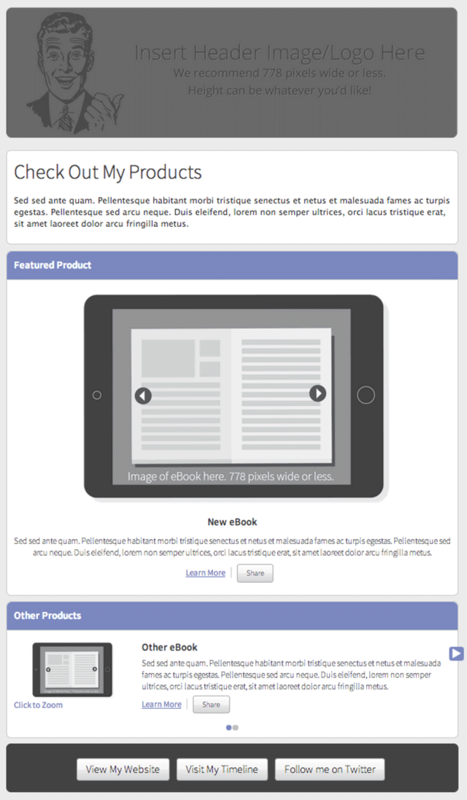 The Single Product Promo template is a perfect way to do just that. If you’re selling toy robots, a lot of your work is already done. 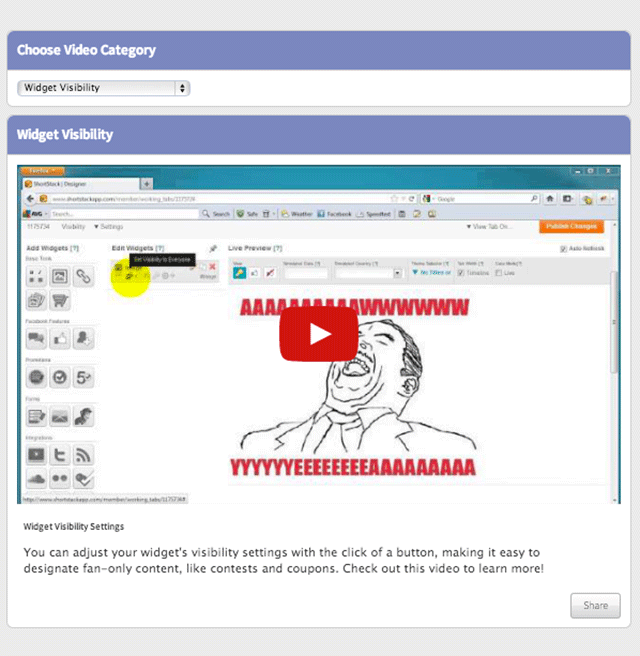 DESCRIPTION: Display a video library, organized by category (one widget per category) with a drop-down selector at the top. 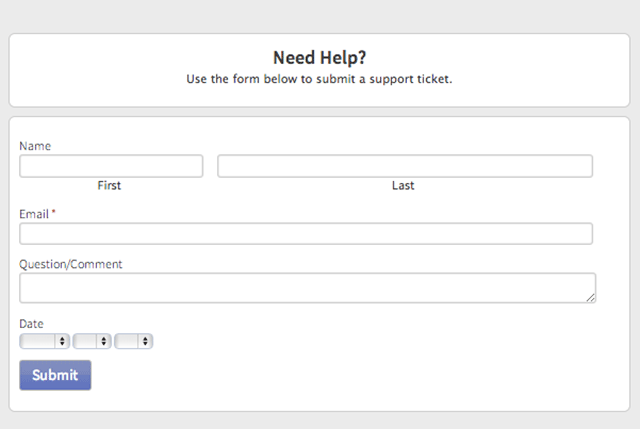 DESCRIPTION: The support desk template is the easiest way to get questions/comments from your customers. The form is laid out to include their name, email, date, and question or comment, after filling that out they just click submit and you get their message right to your e-mail. 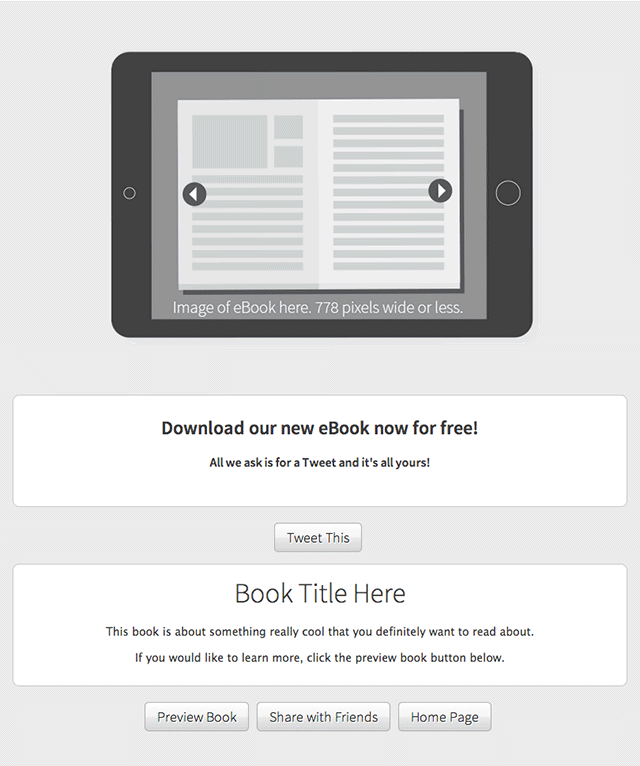 DESCRIPTION: Use this template to promote and let users download your eBook. By integrating with Twitter you can open your eBook downloads to multiple audiences. 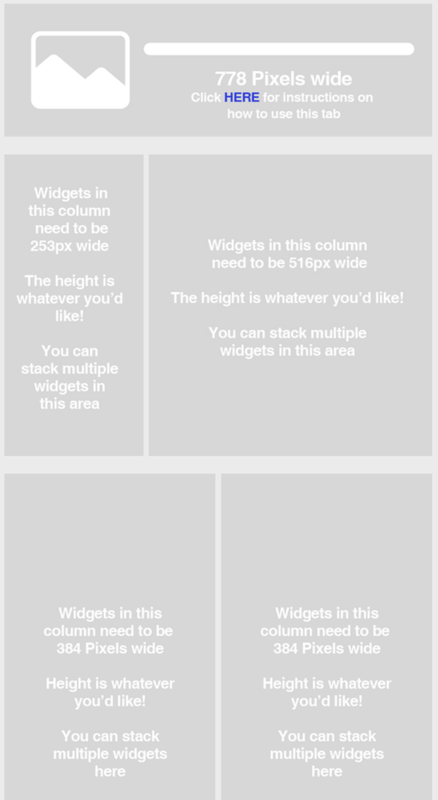 DESCRIPTION: Instead of displaying all the video thumbnails in a single sliding row, this template lets the thumbnails cascade down the page, with an option to insert the video titles below the thumbnails. 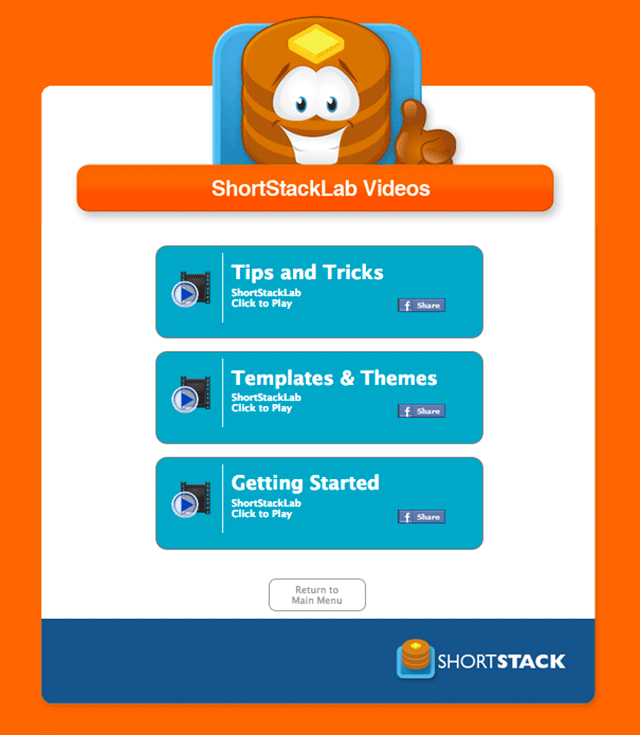 DESCRIPTION: Display all of the videos from your YouTube Channel in this Template. You can highlight a top video and provide thumbnails to the remaining videos with links back to you web and social media sites. DESCRIPTION: The perfect template for fitness and health Pages. 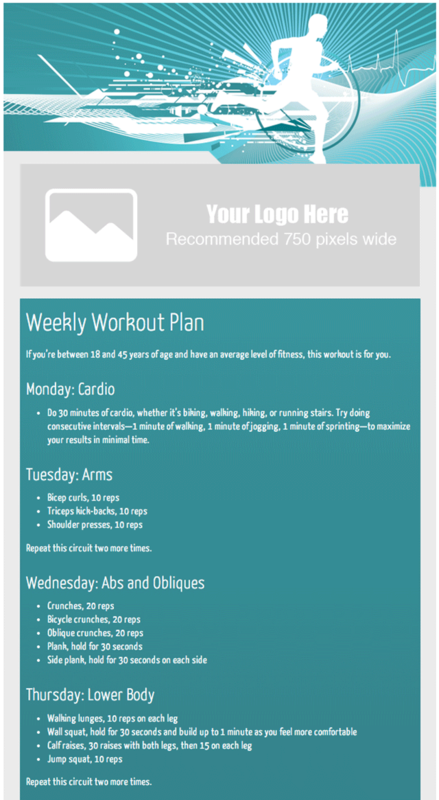 This template makes it easy to offer your fans a weekly workout plan, training schedules and dietary meals. It even has space to throw in some workout music to give your fans some extra motivation. 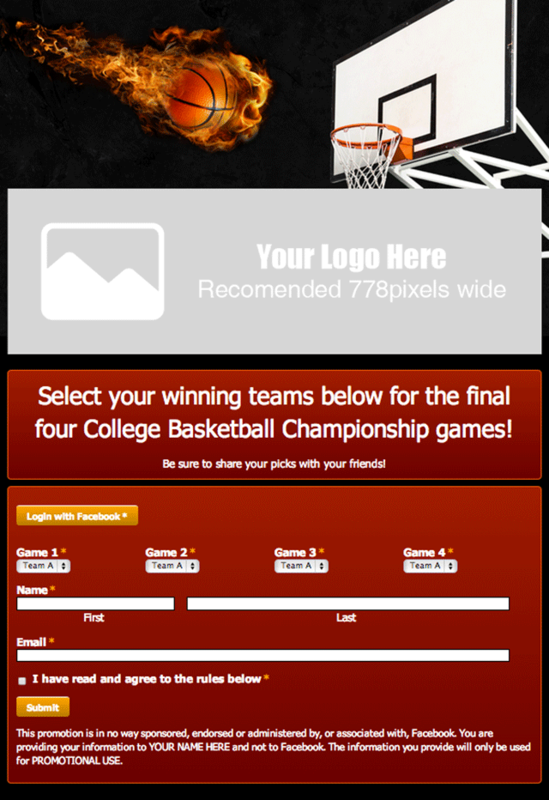 DESCRIPTION: Run a fun engaging app for your Fans that allows them to pick their top teams the College Basketball Championship games. 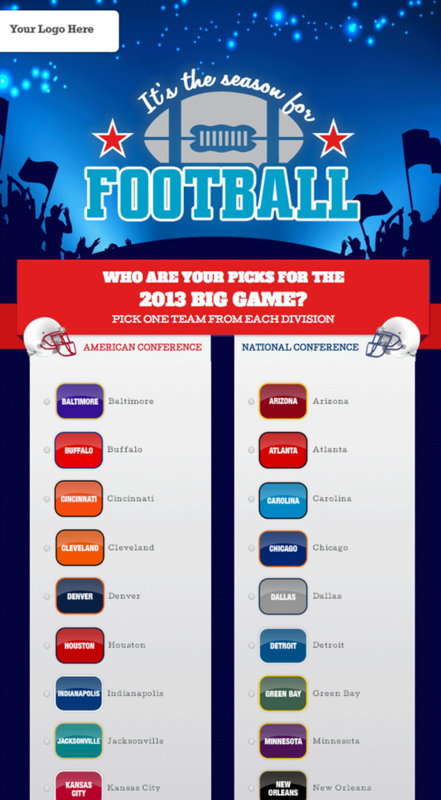 DESCRIPTION: Ask your fans to submit their picks for the SuperBowl and other big games! With this template you can list all participating teams. DESCRIPTION: Interact with your fans throughout the entire Football season with this template! 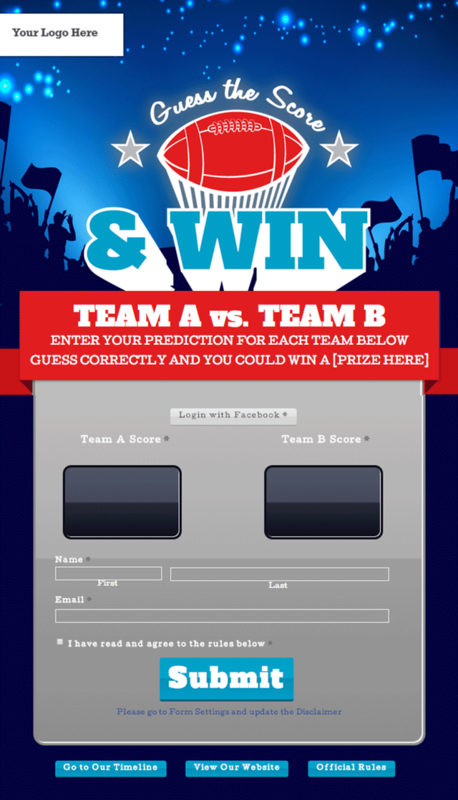 It’s designed to allow your fans to guess their scores for the game each week. 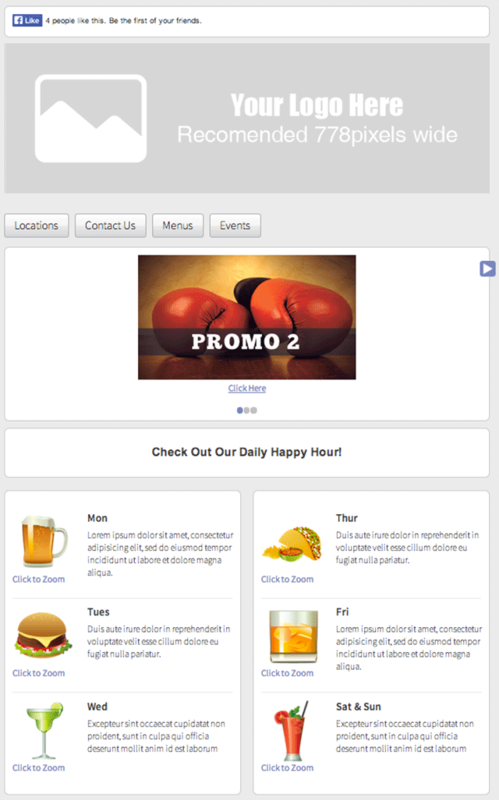 DESCRIPTION: Keep your sports bar’s Facebook fans in-the-know with this template that includes Twitter, Foursquare, and food and drink specials. Tweet about the big game, watch the fans check in, and advertise your happy hour, and have it all on one app! 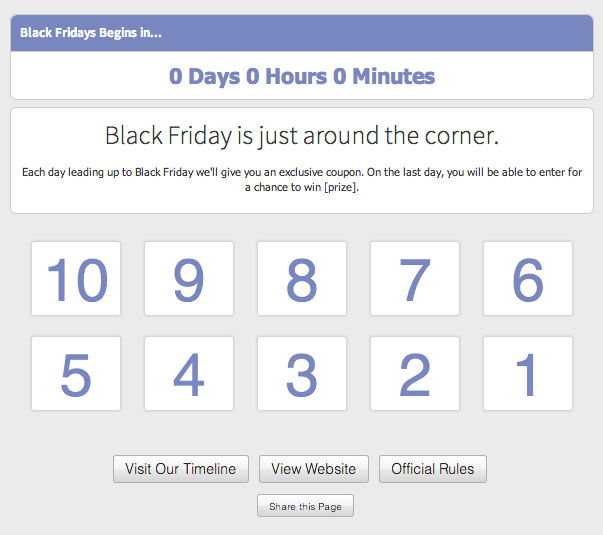 DESCRIPTION: Countdown the days till Black Friday! 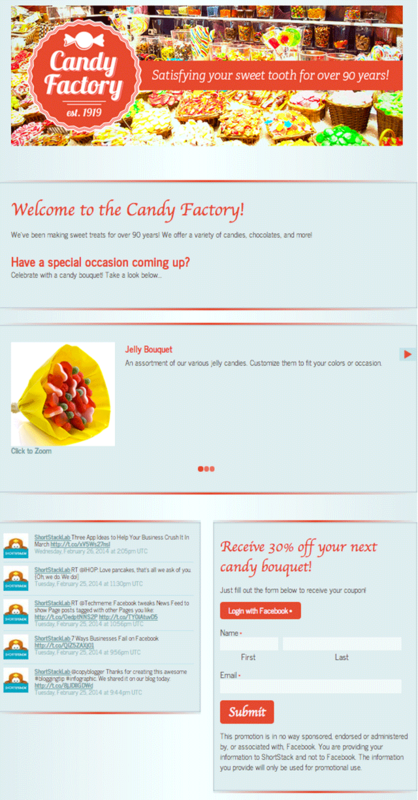 This template is set up to allow you to offer a surprise gift or coupon each day leading up to Black Friday. Add on/take away days at your own leisure. 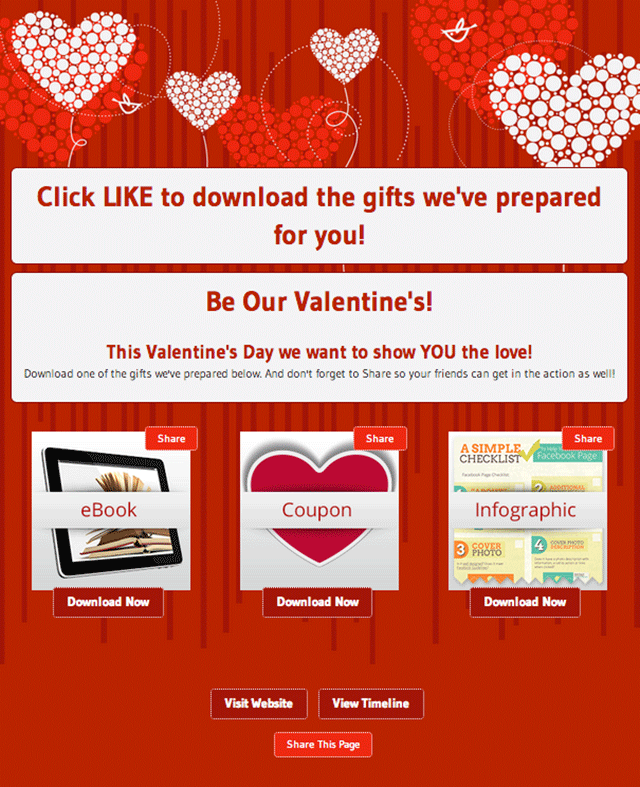 DESCRIPTION: Show your fans some extra love for Valentine’s Day with this template that offers several “gifts” for your followers. Provide everything from resources to coupons with this template. 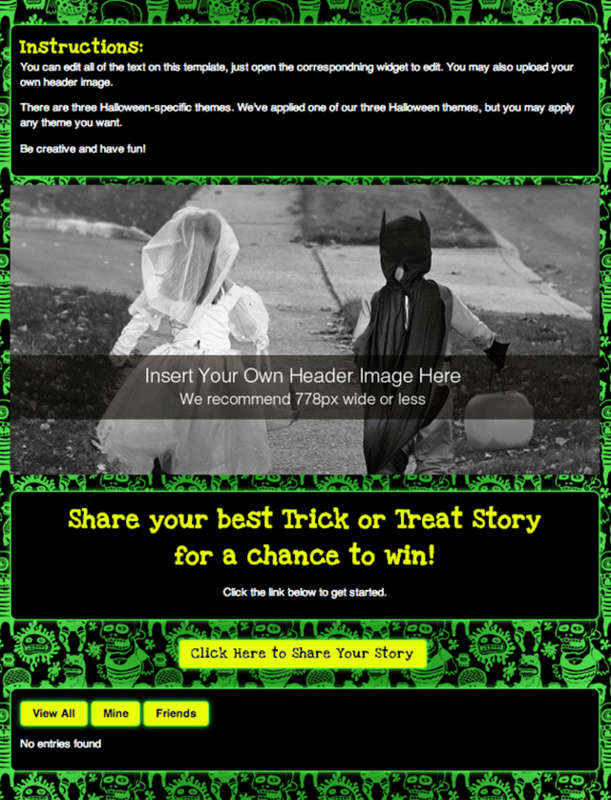 DESCRIPTION: Ask your fans to submit their best Halloween costumes using this spooky template. 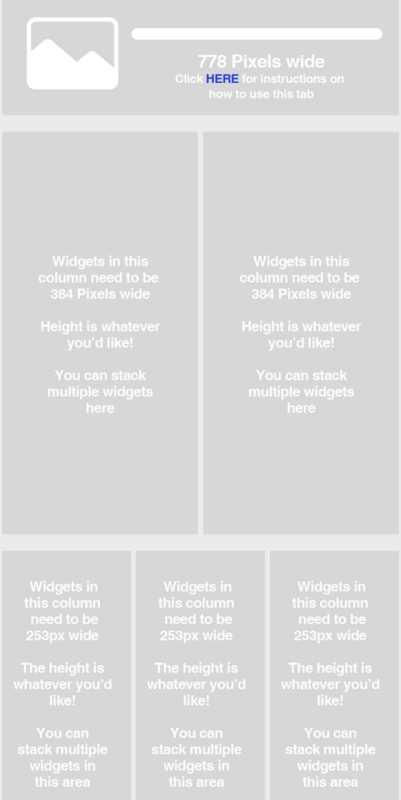 DESCRIPTION: Want to run a campaign where users can unlock content on your app daily? Well, this template can help! 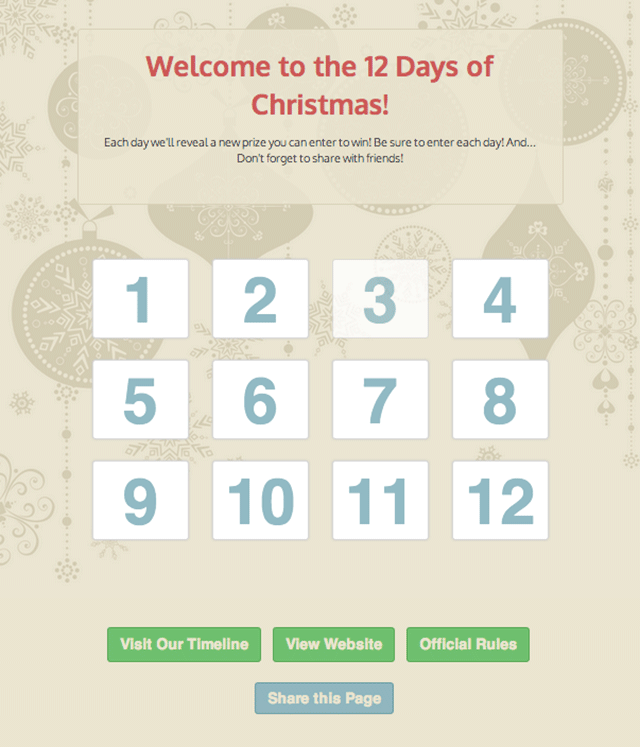 Using this template as an app on your Page will allow users to click on different days to see if the contest for that day has been revealed yet. 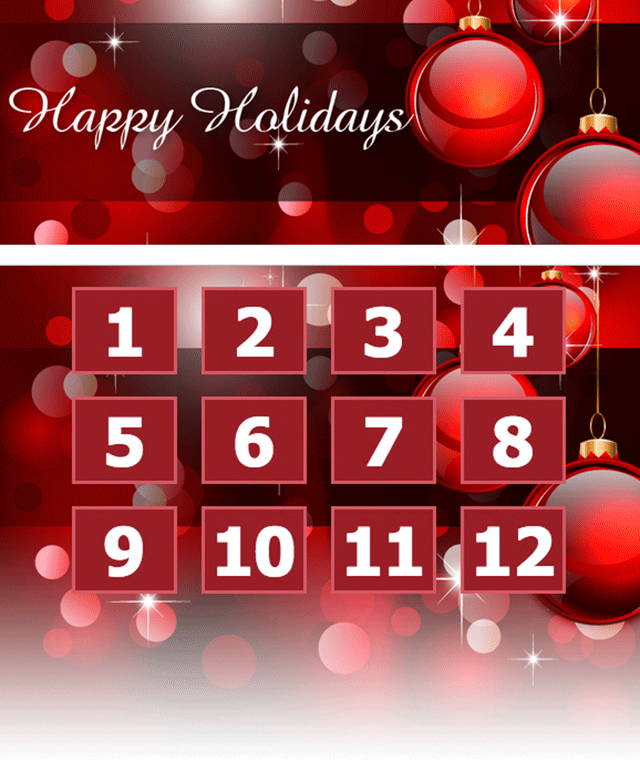 DESCRIPTION: This template let you offer up 12 days of giveaways for the holidays! 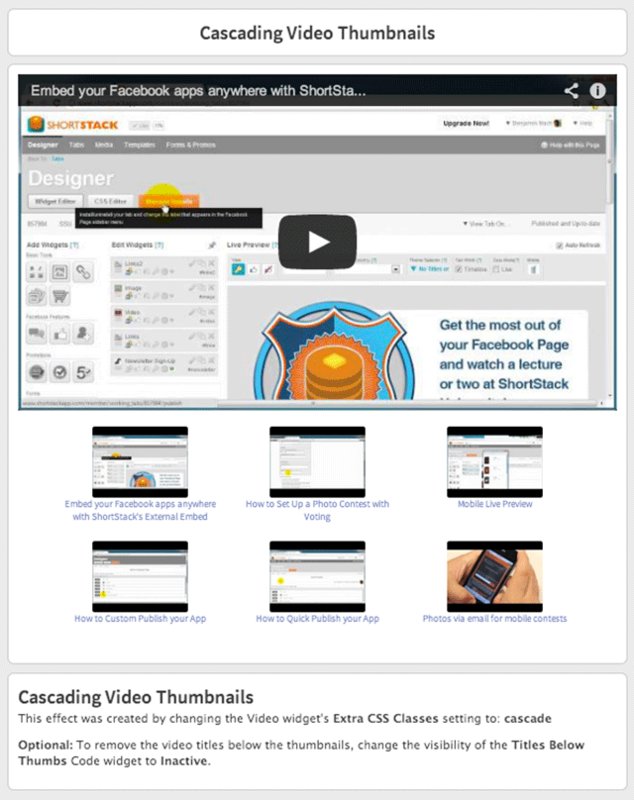 It’s one of ShortStack’s most popular templates! 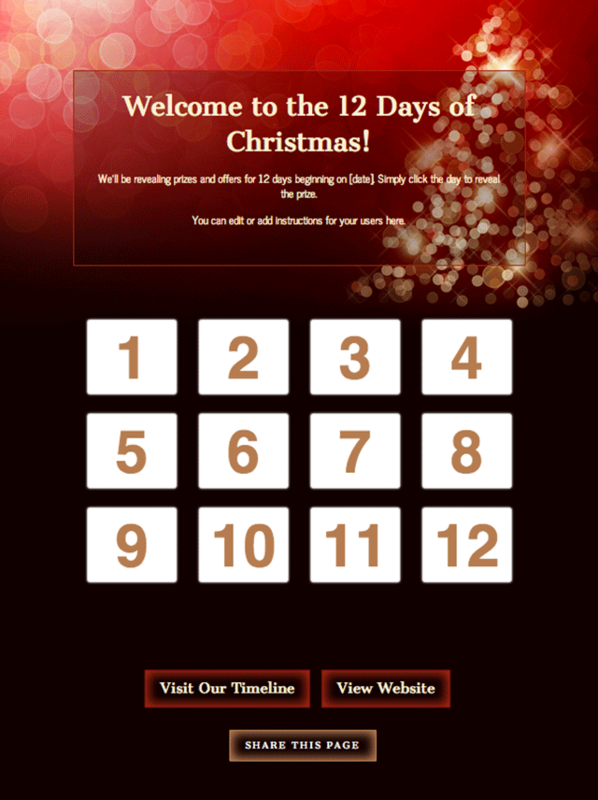 DESCRIPTION: Another version for the 12 days of giveaways around the holidays to keep your fans engaged and excited about your Page. DESCRIPTION: We recognize that people love dressing up their pets and taking pictures of them. 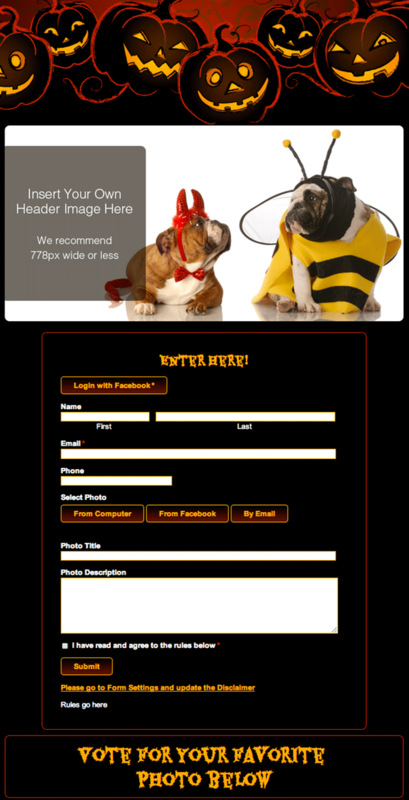 This template lets your fans submit their best pet costumes for Halloween to be voted on by other fans. DESCRIPTION: Engage with your fans during Halloween with this template that asks them to submit their best trick or treat story for a chance to win! DESCRIPTION: Want to say ‘thanks’ to your new Fans for liking your Page? Use this template to offer coupons. Whether it’s free stuff, free service, or discounts, that’s up to you! DESCRIPTION: Do you need to create an app in multiple languages? No worries this template can help you do that! 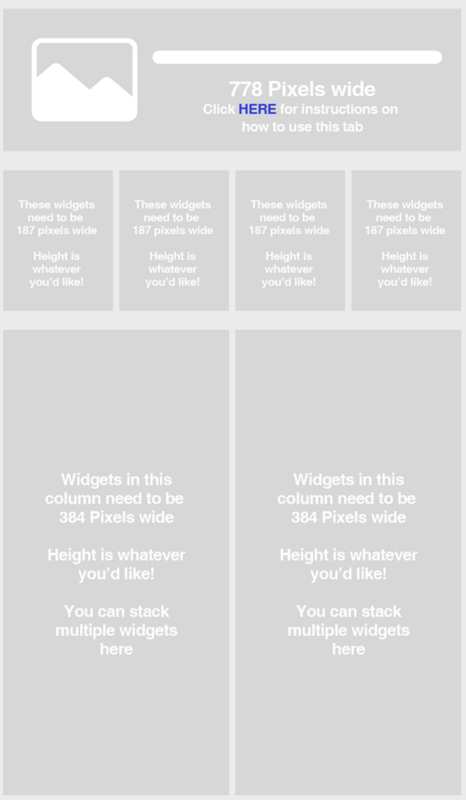 Display your app in multiple languages using sub tabs. 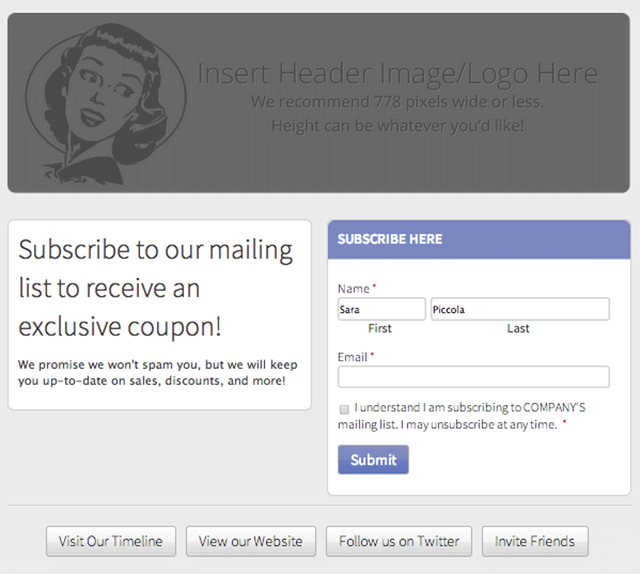 DESCRIPTION: This template offers a coupon to your Fans after they’ve filled out a form. 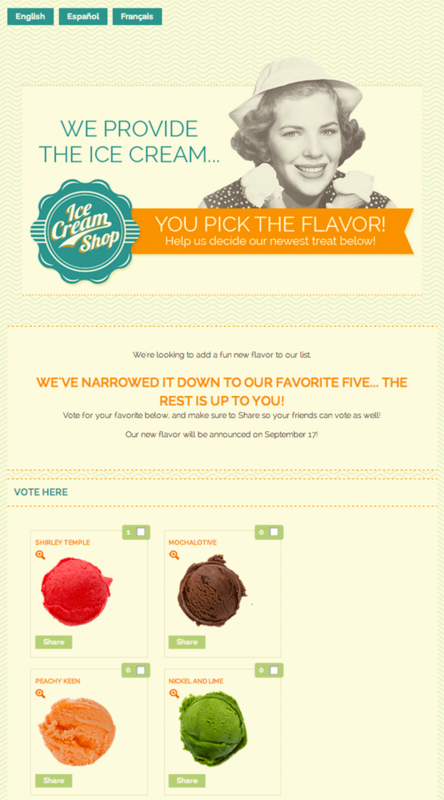 A great way to collect data and reward your Fans. 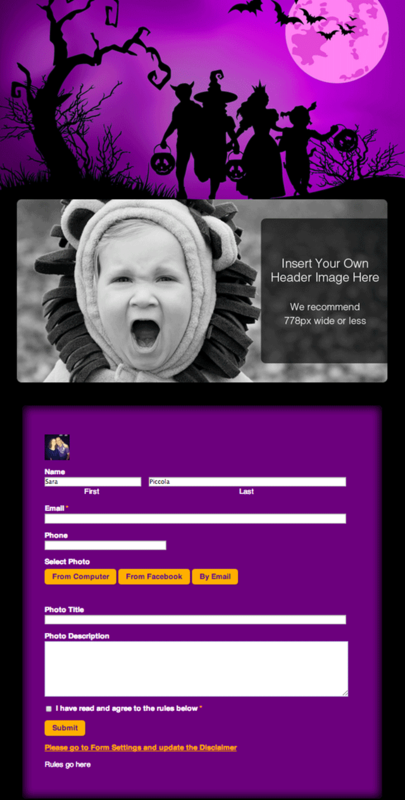 DESCRIPTION: This template is perfect for getting your Photography out in the open. 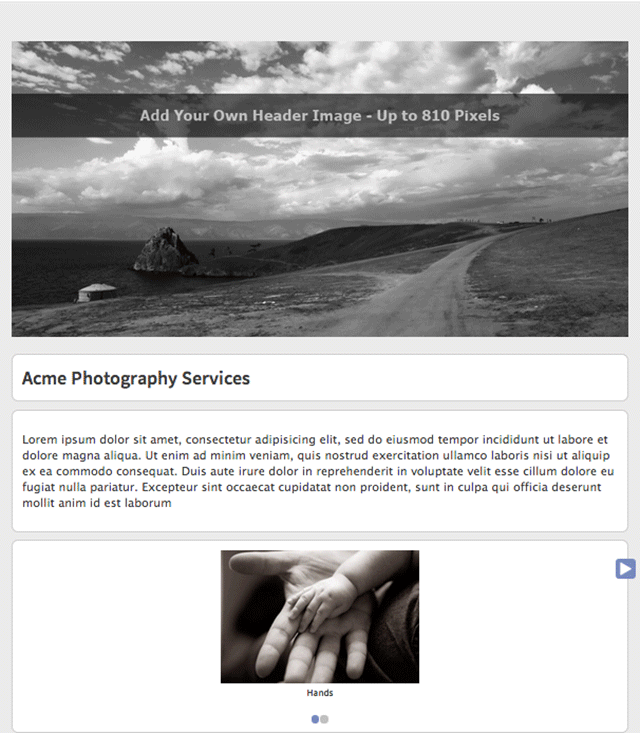 Include prints for sale, a contact form for booking, and examples of your work. 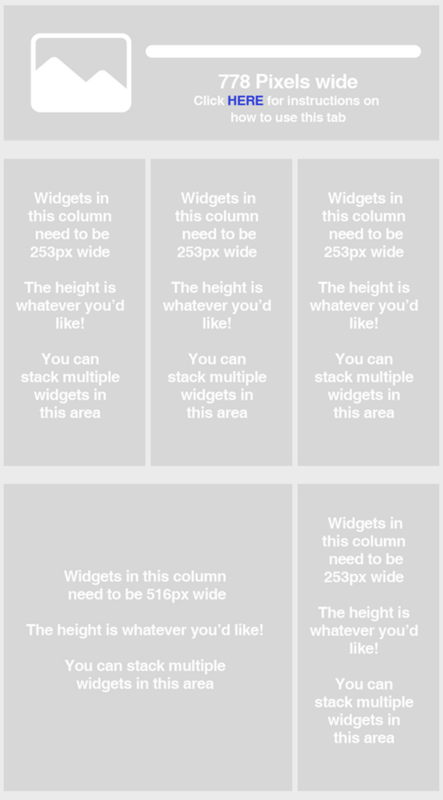 Add your unique touch, and check out other themes to use with this template! 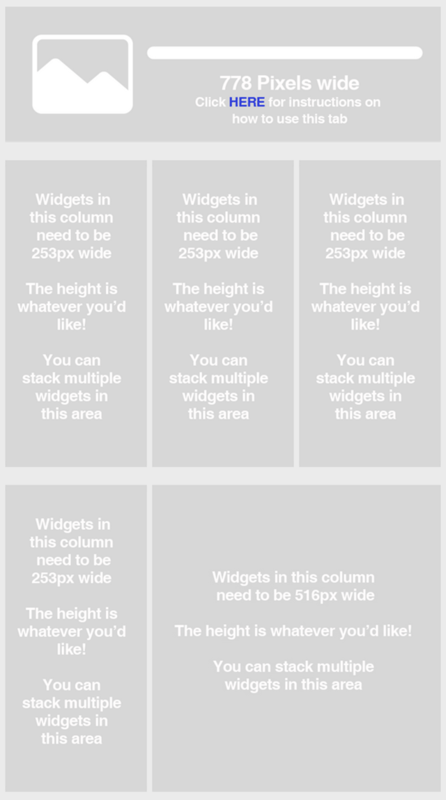 DESCRIPTION: Sick of having the one big center column layout on your Facebook Page? 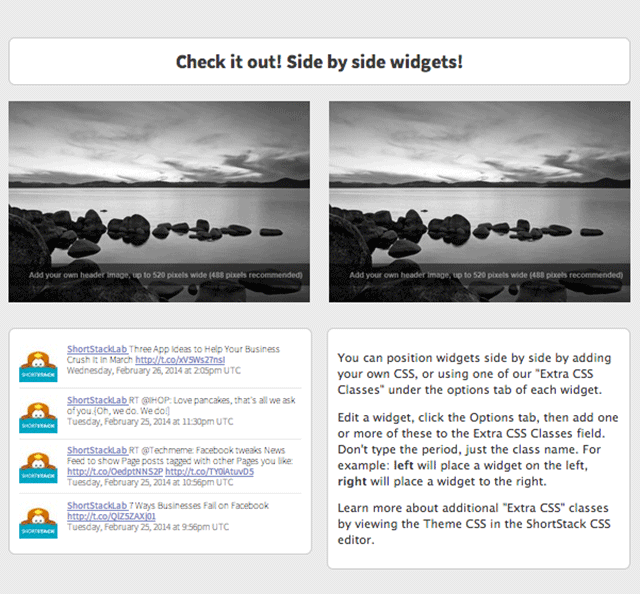 Try our side-by-side template and make your tabs unique. 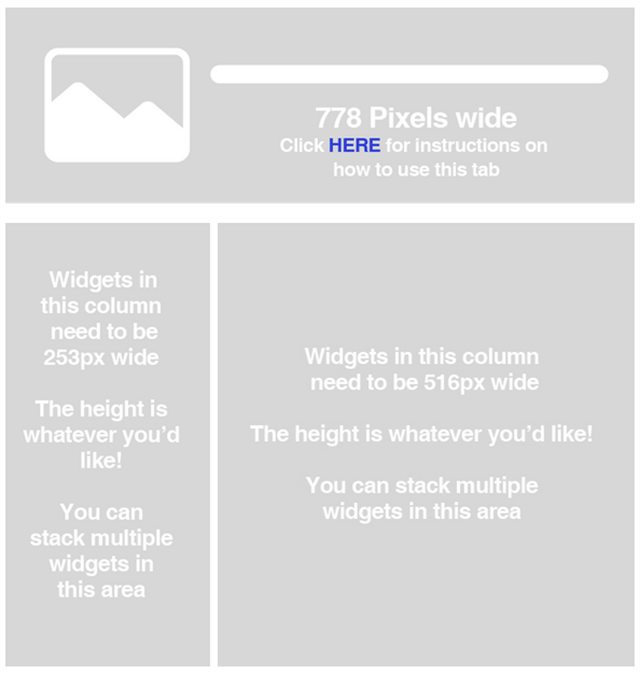 This template comes with Image and Twitter Widgets added, plus instructions to add more content in the two-column format. 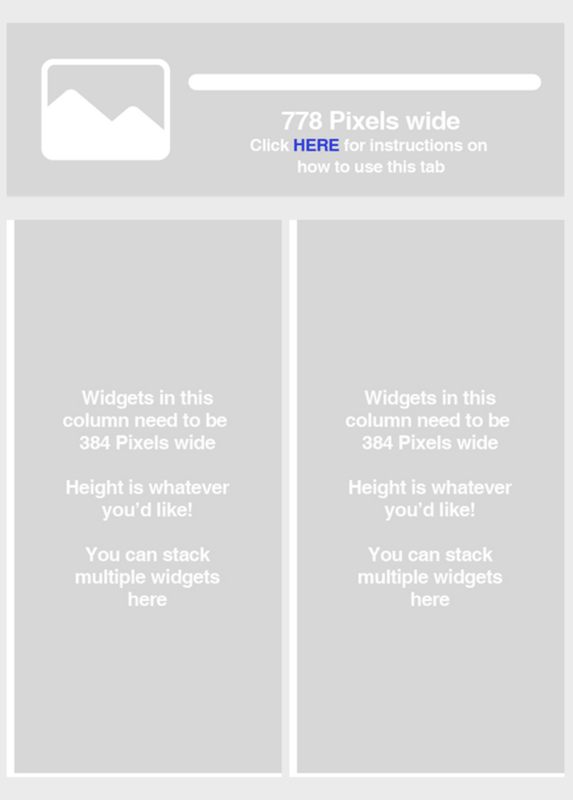 DESCRIPTION: Similar to our first Sub Tabs template, but with navigation links down the left side that collapse into a drop-down button on mobile devices. 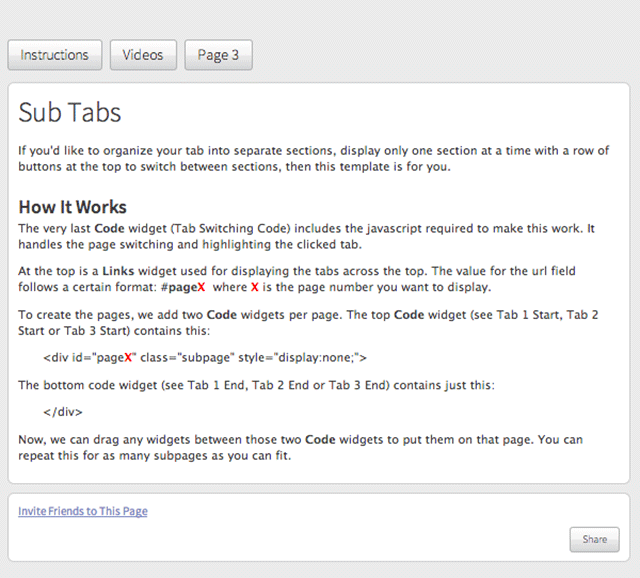 DESCRIPTION: Instead of creating lots of tabs, use this template to create one tab with multiple sub tabs. 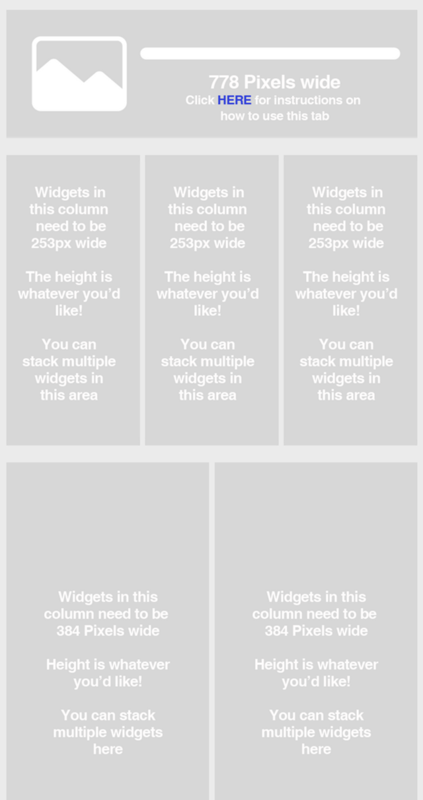 Group your widgets into ‘pages’ and display them with a familiar tab interface. 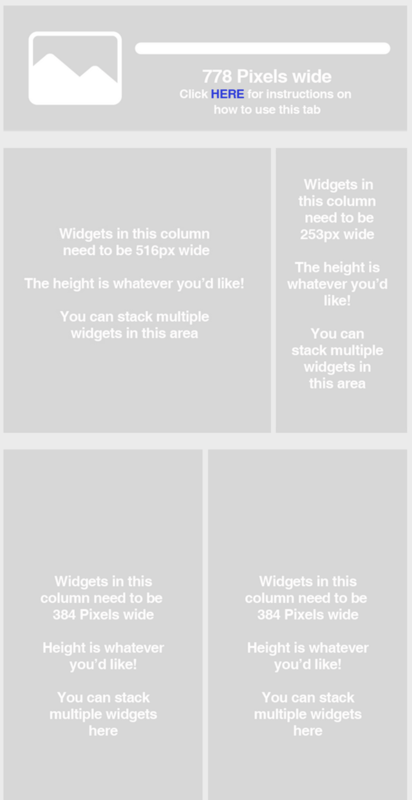 DESCRIPTION: Use this template to create your own themes to use on other template and custom built apps. 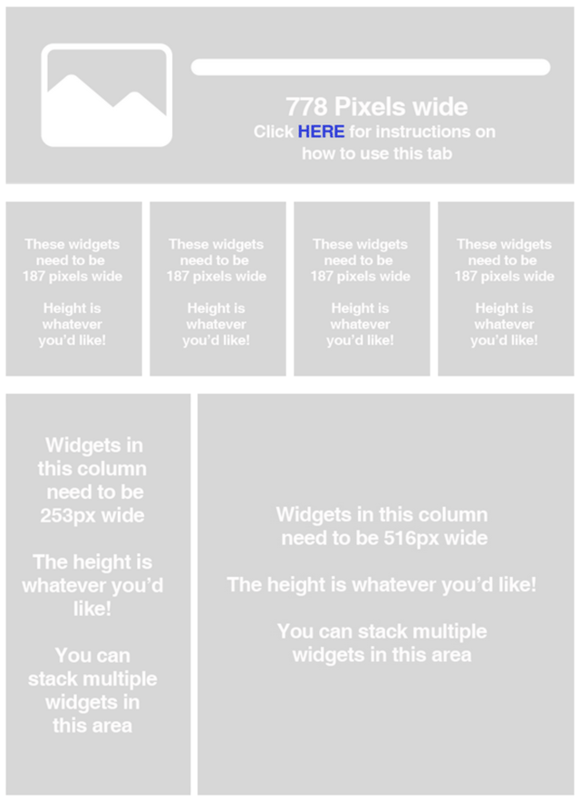 We hope you enjoyed learning about these 100+ template you can use to build awesome apps for your Facebook Page and website!